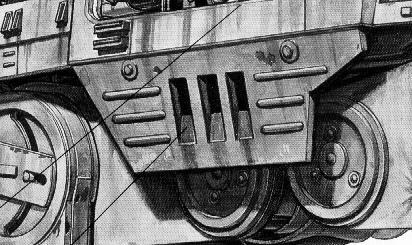 This page is a review of the most visible kind of military ground vehicles in STAR WARS , and a starting point for consideration of topics related to ground combat in that universe. The cursory but broad collective survey of military walkers is written for the purpose of illuminating the common physical and functional characteristics of these craft. The commentary deliberately foregoes indulgence in small details for the sake of forming a more concise overview. Particular sections may be elaborated into in-depth sub-pages at some point in the future. Possible areas for further study include physical analyses and measurements of walker motion, firepower and the effectiveness of walker armour and other defences. Parallel commentaries should eventually catalogue and consider military crawlers, repulsorcraft and war droids in a similar manner. 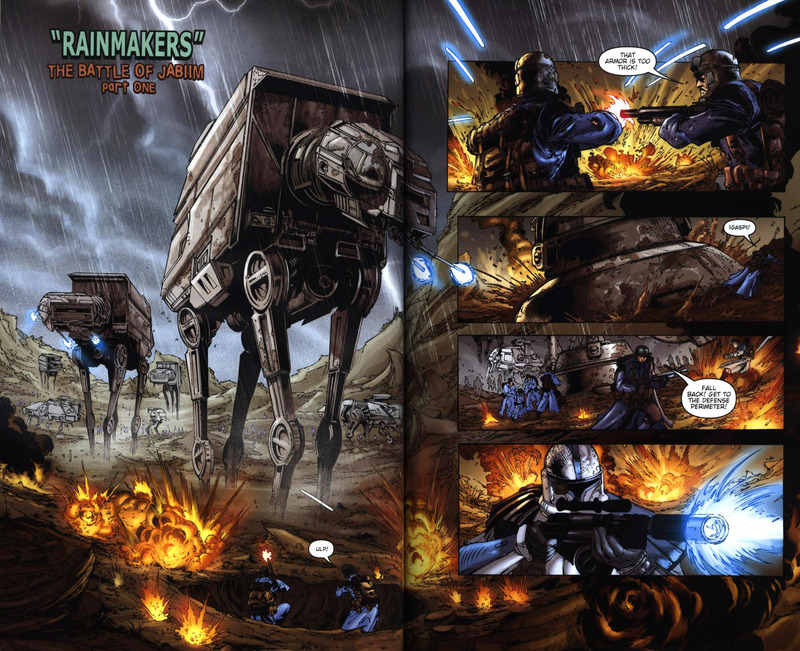 The concept of the military walker must have some practical advantage within the overall strategic and tactical scheme of the Imperial Forces. Walkers must have military value in relation to the other instruments of surface warfare such as repulsorcraft, artillery, infantry and support from fighters and warships in space. Whatever the key benefits walkers provide may be, it must be due to something other than speed. Armour is an advantage, but it doesn't explain why a walker design is better than an armoured repulsorlift vehicles of similar size. Possibly the best answer is found in the names of these vehicles - "all terrain". Walkers are good for negotiating extremely variable terrain strewn with obstacles. Although a repuslorlift vehicle of equivalent size may be faster, it is a single rigid object. A walker's flexibility makes it easier to deal with terrain features which are abrupt and comparable to the size of the vehicle itself. Additionally, Essential Guide to Vehicles & Vessels and other sources indicate that there are locations in the galaxy where unusually variable gravitational or magnetic conditions confound standard repulsorcraft. Simply being in contact with the ground is an advantage for a walker. The ground is a potent device for vehicular control. A ground vehicle under fire or delivering its own momentous volleys is braced and supported by the ground. The advantage of traction allows a surface vehicle to stop, start and dodge in an instant, whereas a turning or braking aircraft has to use lateral thrusters or rely upon relatively tenuous frictional contact with the air. Crawlers share these benefits, but they lack the articulation that helps walkers on particularly rough terrain. Of course the cost of this stability and versatility is that walkers have very limited speed. This drawback means that there is a complimentary relationship between walkers and flying vehicles. Neither of them can serve every imaginable military purpose. Speeds of dozens of kilometres per hour are enough for a walker to dominate footsoldiers and artillery, providing intimidating control over territory. Contrast this with the operation of fast repulsorcraft which must fly higher in order to avoid ground-level obstacles. Repulsorcraft may have quicker access to distant parts of a battle, but their speed means that they have a more superficial presence in any particular location, and they cannot operate so effectively near the ground. 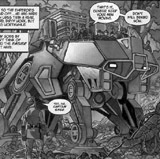 Thus walkers are the prime combat vehicles for the occupation of territory. A walker trades speed for versatility and presence. Walkers are built to seize and assert dominance on the ground. It is noteworthy that the main weapons of known walker models point forwards, laterally or downwards. They are directed at enemy peer vehicles or at ground targets. Walker designers may assume that whenever necessary, walkers will operate in conjunction with friendly flying forces that are able to provide cover from enemy starfighters and airfighters. This was not the case in many of the battles in the existing literature. 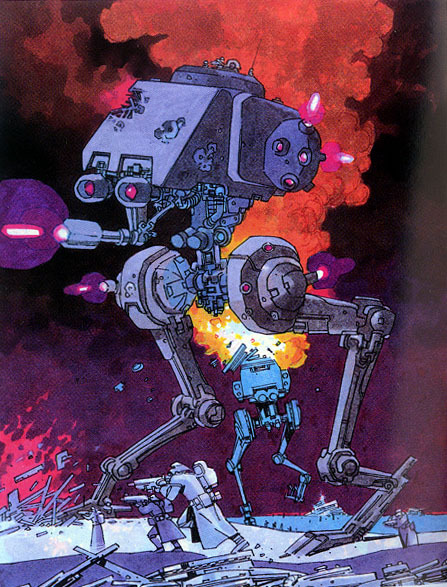 In the movies, Imperial walkers only faced opponents with much inferior firepower. 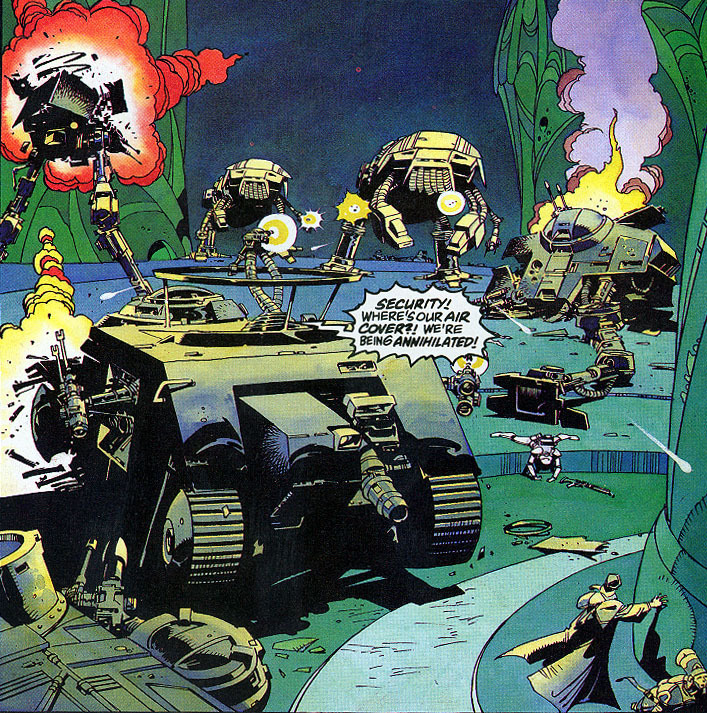 During the Battle of Byss in Dark Empire II , the walker and crawler forces did benefit from air cover, which was swiftly defeated in the confined urban battleground. 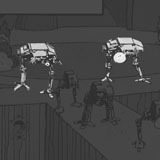 All of the above-mentioned features and advantages of walkers are also shared by large war droids. Deploying crewed walkers rather than similar machines with droid intelligence has more subtle tactical benefits that may not be immediately obvious to opponents on the battleground. The basic difference is concerned with decision-making capabilities. 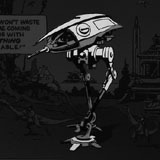 Although a droid army may be programmed with faster reflexes and greater specific skills, an army of disconnected but cooperative living warriors have a very different capacity for establishing and revising priorities. The drawback of the droid mind is that it is factory-pressed and ideosyncratic. Large groups of identical combat droids necessarily exhibit a sameness of behaviour that a smart living commander can exploit. 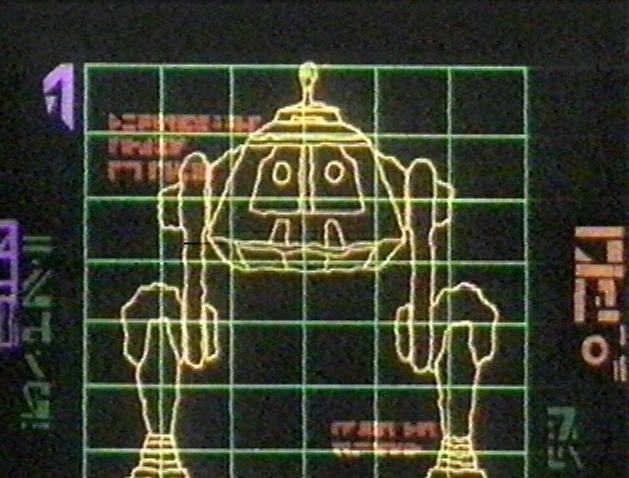 This was shown graphically in the Balmorran victory over Imperial invaders in Dark Empire II , when the Balmorrans droids themselves were programmed to anticipate the older Imperial models. On the other hand, human walker crews all carry the variety of minor neuroses and inspirations that are a natural part of being a living animal for at least two decades, and these personal differences, and manifestations of informed volition, may affect the combat reactions of each walker, making each one slightly unique. The physical advantages of a droid can be matched by the walker's integrated sensor, communications and targeting systems. The difference between a walker and a war droid is the difference between a user with a tool and a smart tool alone. 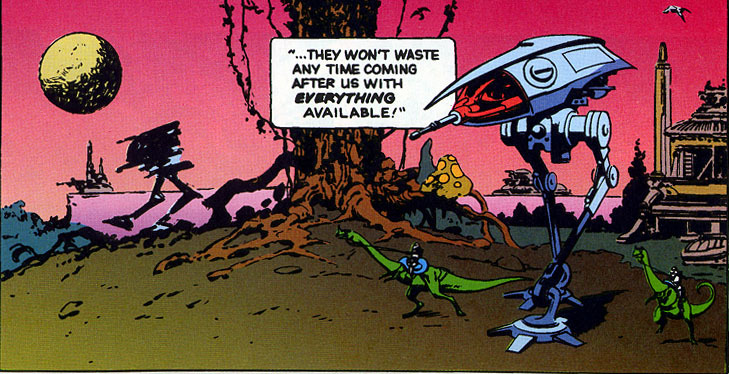 Of course war droids are more advantageous than walkers in certain circumstances, otherwise they never would have been invented. Xim the Despot, the Trade Federation in The Phantom Menace , and the Imperial holdouts of the Deep Core all used combat-capable droids to fight their battles wholly or in conjunction with regular forces. The key factor common to all these powers is that manufacturing was more economical than recruitment and crew training. Xim, being a vile pirate warlord, controlled only a small part of the galaxy and he may not have had much confidence in the loyalty of his subordinates. The Deep Core Imperial enclaves consisted of essentially barren space, with very few inhabited systems and insufficient time for personnel training to keep pace with the Palpatine clones' expansionist ambitions. 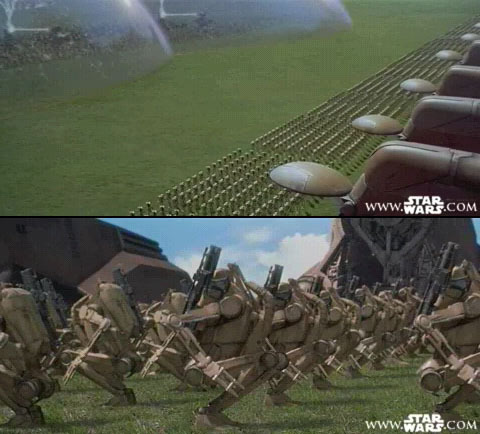 The battle droid description in Behind the Magic indicates that they are a secondary kind of army, assembled as a matter of discretion, and they are not otherwise preferred to living troops. A live army is more difficult to conceal, due to the conspicuousness of recruitment and indoctrination. Battle droids are the kind of army that is built whilst pretending not to have an army. A full galactic government, on the other hand, has nearly endless manpower to call upon. Although walker crewmen share similar or possibly identical training, the diverse functions of the machine dictate a diversity of forms. Of all vehicles in the broad walker category, there are many different designs serving unrelated operational purposes. Some walker models are large enough to fulfill other roles in addition to that of a basic assault vehicle. 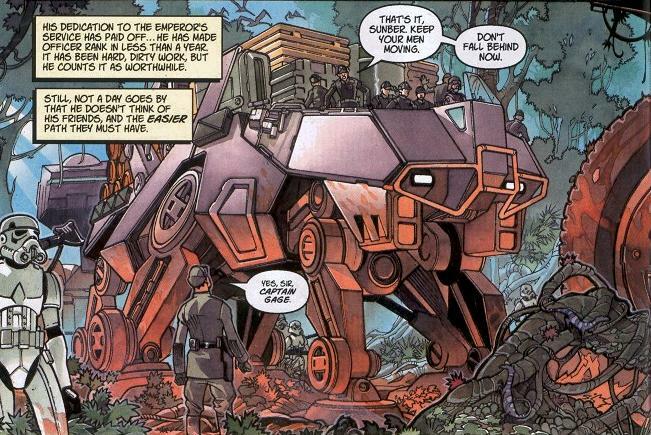 For instance, the AT-AT walker serves as an armoured personnel carrier (at platoon level) as well as an indomitable mobile weapons platform. Smaller walkers may have fewer interior options but their mobility and lesser durability suits them to tasks where a more fleeting presence is required. A side-effect of a walker's powerful presence is its enormous visibility on certain kinds of open terrain. The greatest of walkers make formidable targets that are slow-moving compared to their size. However the resources of the Empire are such that it can afford to build and deploy vehicles with armour and other protection that confidently surpasses the firepower of their expected opponents. On the other hand, visibility can be a great asset. Walker gunners have a good view of the surrounding battlefield, and they can shoot what they see. Exposure to enemy fire is not so great a concern when the enemy's fire is much less powerful. Height and presence also imparts the advantage of immense intimidation, when the walkers are operating from a position of strength. The physical dominance and remarkable combat effectiveness of some models of Imperial walkers has led to a notion that they are "weapons of terror." This is an exceptionally negative idea and it probably reflects an envious pro-rebel bias in most references. Effectiveness is terrifying, but terror is not the same thing as effectiveness. If walkers depended on scaring opponents rather than their basic military capabilities, then they would suffer abyssmal defeats against battlefield foes who were either well-trained or who belonged to species with very nonhuman thinking. Even cheap war droids can be made to be dauntless in the face of a walker. Intimidation may be an incidental benefit of walker design, but not necessarily a key function. Armoured landspeeders and repulsortanks may be speedy and able to cross mud surfaces, but on rough and solid terrain walkers are more solidly grounded and exert a less fleeting presence. 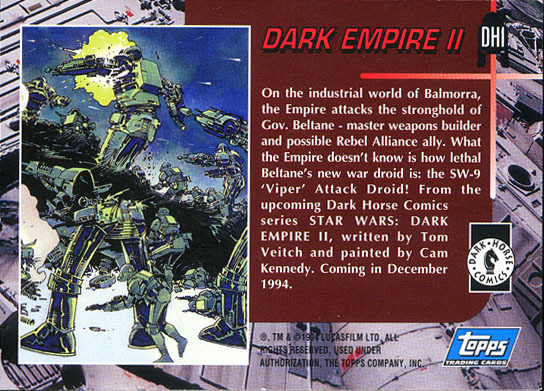 Balmorran war droids and troopers fight their Imperial counterparts in Dark Empire II . In order to see action on a planet, walkers must be ferried to the surface from their mothership or depot. In controlled territory they could be shipped in parts and assembled in a secure facility. However deployment in a battle zone requires that the walkers be landed whole with their crews in a state of readiness. This requires an armoured landing barge. Unfortunately these vital vessels are not often depicted in the filmed and unfilmed STAR WARS literature. A walker landing barge must be at least large enough to contain its particular cargo. Knowing the dimensions of various walker models tells us that the corresponding barges must be greater than a certain size. At the same time, the barges cannot be arbitrarily large, or else they will not be suitable for use from certain classes of motherships. It is doubtful whether the regular hangar apertures of common star destroyers are able to pass a barge large enough to contain more than a handful of tightly packed AT-AT walkers, let alone a barge carrying one of the large walker models. 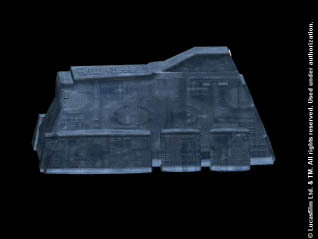 In non-canon official publications there is an implicit assumption that the destroyers can deploy walkers, but it's not clear whether a suitable landing barge could fit through the forward bay, which has the largest hangar on the ship. If this is possible, each barge could not carry very many walkers at once. Since an AT-AT is about the same size as a Lambda-class shuttle, and the shuttle appears to be a snug fit for the forward launch bay, the barge might not contain much more than a single crouching walker. One class of walker barge that may be suitably compact is seen in Force Commander . The ship seems to carry just one squatting AT-AT, and thus its bounding dimensions are probably not greater than those a Lambda-class shuttle. If so then it should be able to pass through a star destroyer's forward launch bay. The bottom-heavy aspect of this particular barge, like that of the Trade Federation MTT craft in TPM , may have a functional explanation: optimal distribution of weight on the ground. A vessel of the same mass but smaller footprint would be less stable and might be prone to sinking into the ground on certain terrains (no matter whether the contact is physical or repulsorlift). Thus the design of this barge is a balance of two constraints: being able to fit through the hangar facilities of a modest warship; and maximising the spread of its weight on the ground. 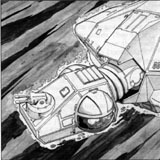 The comic X-Wing Rogue Squadron: Mandatory Retirement shows the loading of what appears to be a larger, collapsible barge in the exposed space of a major bay of a star destroyer. It appears that the barge was brought out through a hangar aperture in a compacted form, and was suspended and expanded in the outer bay. Cranes were then used to move several crouching walkers from the hangar into the barge. This scheme provides for a more rapid deployment than the multiple launches of a deployment using single-walker barges, but the drawback is that the barge seems less robust, and the exposed loading process presents a tempting target for any hostile spacecraft in the destroyer's vicinity. 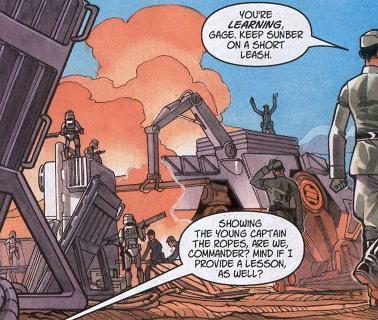 A simpler explanation for the barge-size conundrum would be that destroyers are not normally meant to deploy fully assembled walkers in hostile conditions, but they may carry parts for the resupply of garrisons. The AT-ATs participating in the Battle of Hoth probably came from the Executor, where General Veers was stationed, and which has vast space available for the launch of huge barges. The unfilmed, sheltered forward end of the Executor's main ventral cavity may have several open hangars capable of launching barges big enough to carry good numbers of any of the known walker types. 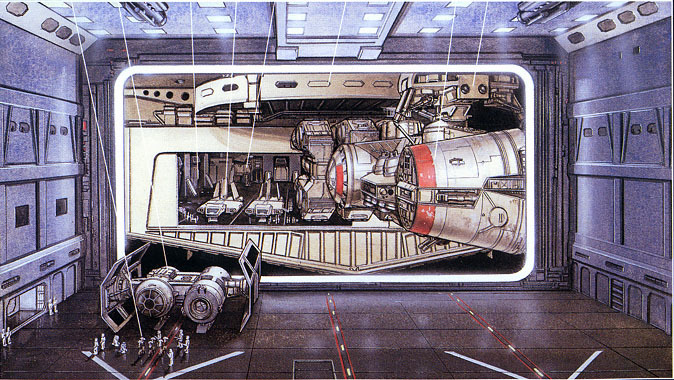 STAR WARS Incredible Cross Sections suggests the existence of an enormous oversized hangar cavity at the aft end of the main bay of the star destroyer Devastator. Apparently, huge sections of the wall on this ship slide lumberingly away to allow the ingress and egress of barges and other landing craft. An unsheltered forward-facing hangar is an extreme tactical liability for any spacegoing warship, therefore this aperture could only be put into operation when all possible attackers have been cleared from the star destroyer's theatre. The AT-AT cut-away diagram in STAR WARS Incredible Cross Sections indicates that the large notched surfaces on the lower edges of the hull sides are actually the attachment points for clamps that secure each walker inside the landing barge. These braces make a great deal of sense, especially in case the inertial dampers inside the barge happen to fail. The jostling of a starship accelerating like those known in STAR WARS might be a danger if there were huge unsecured walkers inside. AT-AT walkers loaded into what appears to be a collapsible landing barge in the ultimate issue of X-Wing Rogue Squadron . 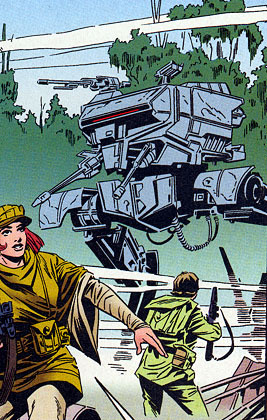 The smaller design of AT-AT walker barge, appearing in Force Commander . It carries two AT-AT walkers side-by-side, or else two AT-ST walkers can substitute for one AT-AT. 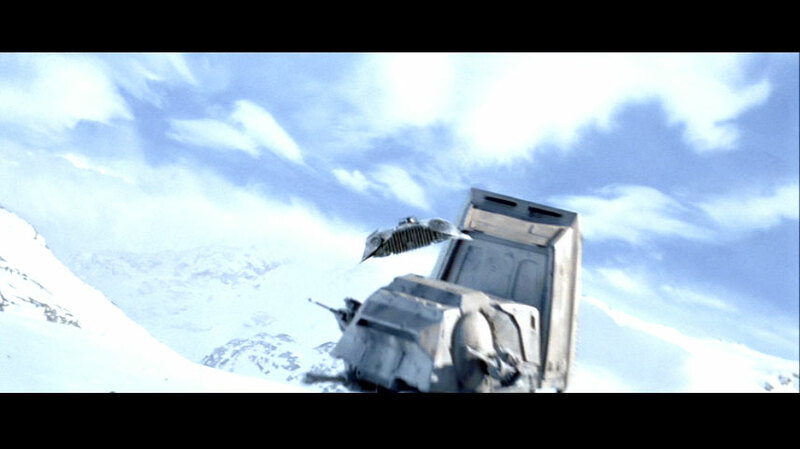 A walker barge deposits a single crouching AT-AT in the promotional demo movie of Force Commander . 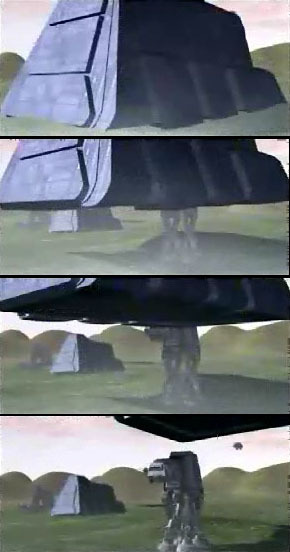 Perspective effects make the barge appear oversized compared to the walker; the second and third frames show that the ship is closer to camera than the walker. Devastator illustrations from STAR WARS Incredible Cross Sections . The first image shows the oversized hangar as seen from one of the normal hangars. (NB. the TIE boarding craft and passengers are actually drawn half the size they should be.) The second image is a cut-away view of the whole docking area. Shipping brace notches on the lower hull of the AT-AT, as identified by STAR WARS Incredible Cross Sections . In the movies, two distinct uniforms for walker crew were seen. AT-AT crews wore a grey and white sealed flightsuit with some additional chest and shoulder armour, which may be a concession to the possibility of personal combat on the ground. AT-ST crews wore similar grey overalls without the armour, and the airtight helmet used by the AT-AT crews is replaced by a grey open-brimmed helmet with chin-strap and goggles. The difference of equipment and uniforms deserves explanation. STAR WARS The Visual Dictionary indicates that the personnel with closed helmets have some history of personal combat, but is silent concerning the unmasked uniforms. Since the men are undoubtedly the same kind of personnel, with similar training, the reason for the variation of dress probably depends on either the vehicle-specific requirements or the operational conditions of different ground missions. AT-ATs and other large walkers may have more complex controls, requiring in-helmet displays like those of naval gunners or starfighter pilots. 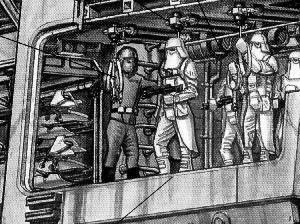 Alternatively, the crews fighting on Hoth may have worn full environment suits as preparation for the contingency of making vehicle repairs in inclement outdoor conditions. But if the cockpit crew are prepared to go outside, then why wasn't General Veers similarly clothed? Did he have optional attachments to quickly turn his suit into an olive-grey equivalent of sealed snowtrooper gear? Perhaps the distinction has something to do with the fact that the walkers on Hoth were landed from space. If these uniforms are used as the army version of a vacuum flightsuit then their similarity to a TIE pilot's uniform would be naturally explained. The walker crews probably do not double as barge crew, because that would require too much multi-skilling, but the descent to ground carries a non-trivial prospect of interruption, hostile boarding or exposure to space. In contrast, the men who drove the scout walkers on Endor were permanently stationed on the ground, in hospitable weather, and they would not have regular exposure to dropship flight. Therefore they could wear a more comfortable and open uniform. Alternatively, the difference could be due to a distinction between stormtrooper and regular army vehicle crews. There is as yet no evidence that stormtroopers have separate armoured vehicle units, but if they do then the stormtrooper-like masks of the AT-AT pilots on Hoth would be easily explained. 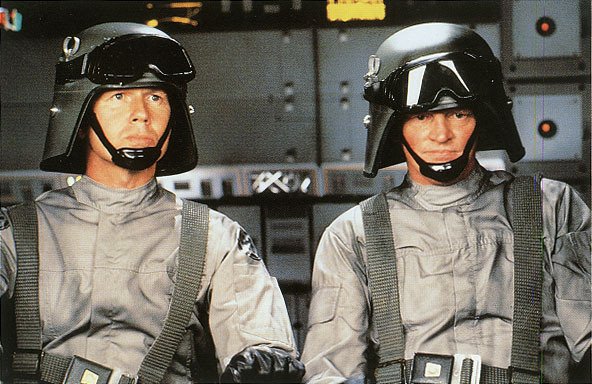 However Imperial starfighter pilots have nearly identical helmets and yet they certainly have no connection with stormtroopers. Therefore the closed helmets of some walker crewmen are not a compelling sign of stormtrooper association. 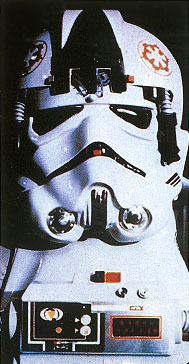 The closed-helmet vehicle crews are implicitly attributed to the regular army in Rules of Engagement roleplaying supplement, which specifically states that "there are no stormtrooper crewed tanks" and that stormtroopers are infantry only. The two known variations of walker crew uniforms. It seems likely that one version is invasion gear or an army flightsuit, whilst the other is standard for garrison forces on friendly territory. Depending on the climate and the walker model, walker cockpits may have one or more viewports that may be either open to the air or made of airtight transparisteel. Transparisteel is a transparent substance that is only somewhat less durable than regular opaque armour; it is favoured on the AT-AT. 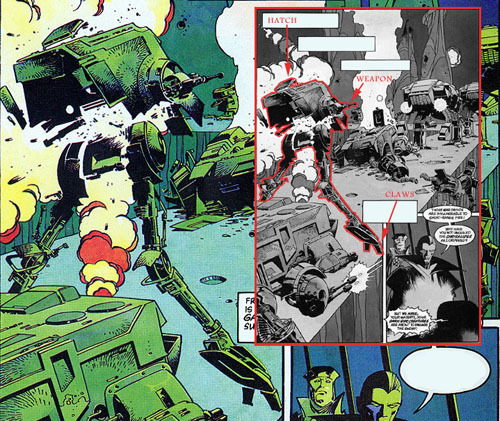 The AT-AT viewport has been known to withstand collision with a rebel snowspeeder [ The Empire Strikes Back novel] but not a concerted attack by lightsabre [ Marvel comics ]. Open viewport hatches offer a more limited view of the surrounding terrain, but permit sound from outside and can be closed by armoured shutters. 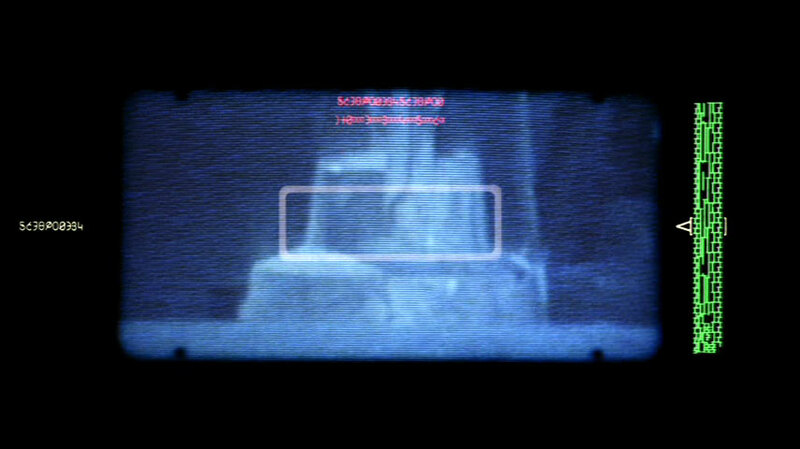 There is something of an enigma about the forward viewport of the AT-AT walker: from the outside it sometimes seems red. 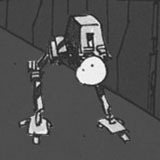 In most pictures of AT-ATs the viewport is too deeply shadowed for any colour to be seen, but there are distinct exceptions. 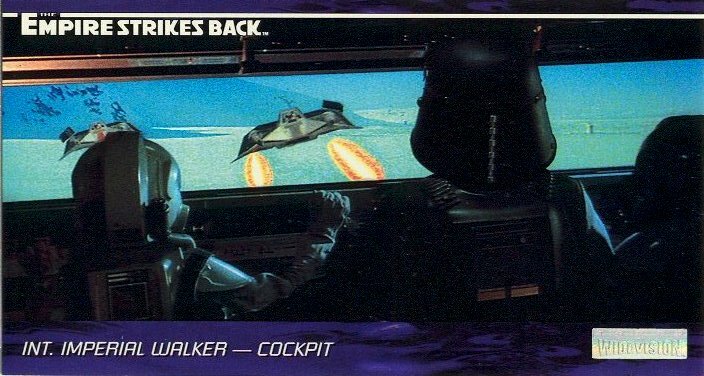 Yet from the cockpit interior, the surrounding scenery does not appear tinted, as seen in General Veers' vehicle in The Empire Strikes Back . Therefore it seems as if the window is not actually red. It would be difficult to conceive of a kind of glass (or "transparisteel") that outwardly reflects red better than other colours, without affecting the colour balance of the light that goes straight through it. The effect probably is not due to the window itself. For some of the Hoth imagery with red windows there is a simple explanation. 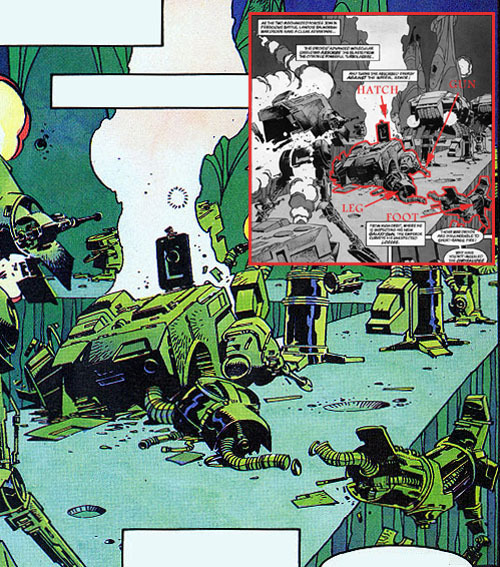 In the best-studied image the walker with the obviously red viewport is the one that has just fired its weaponry. At least according to this evidence, the colour of the viewport might be no more than a reflection of the red flash of the walker's own beam. In Return of the Jedi an AT-AT carrying Luke Skywalker approached an Imperial landing platform during the dark hours of the morning. The cockpit was lit from within and the window did appear red. The nighttime conditions hint that the redness is probably due to the lighting inside the cockpit, not anything to do with the window's intrinsic colour. The use of red illumination at night is common even in primitive nuclear-age cultures. It has the benefit of making things visible without greatly affecting human night-vision. In other words, a walker crewman can see his instruments clearly, but his eyes will adjust more readily if he steps outside into the real darkness. 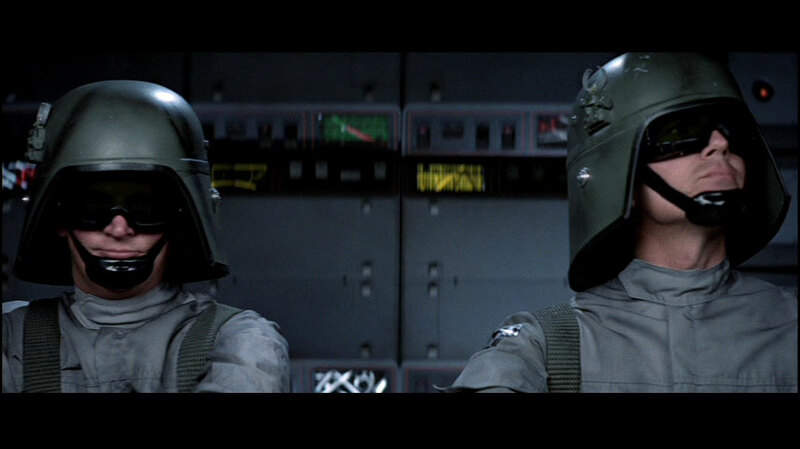 Of course, all walker crewmen have goggles or full helmets that are similar to those of stormtroopers and TIE pilots. These devices usually have built-in displays for visual orientation and tactical data, perhaps supplemented with night-vision and image enhancement computers. But army officers like General Veers and enlisted crewmen in unarmoured dress do not always wear full helmets, and probably don't have the maximum electronic augmentation of their personal sensese. Therefore they at least might benefit from the use of red night-lights in the cockpit. 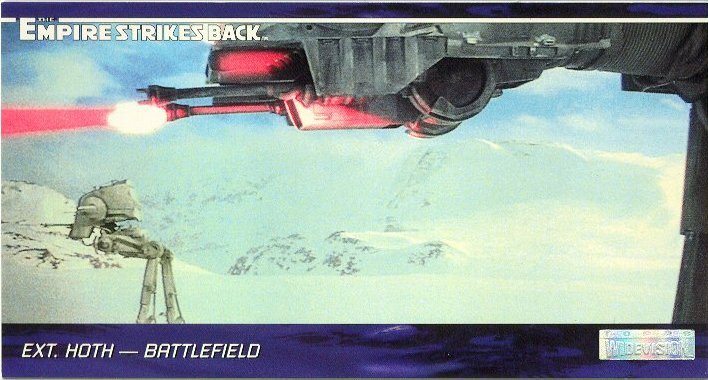 The cockpit night-light seen active on one of the Hoth AT-AT walkers may have been negligently left on at the start of the battle, if the Imperial force landed just before or during dawn. Cockpit window of General Veers' walker during the Battle of Hoth, as seen from within. At least one of the AT-AT walkers on Hoth had a cockpit viewport glowing red dimly. Most known walkers in in all mass ranges have single-jointed toes on their feet. The advantages of toes for a walker are probably similar to the advantages of toes for a walking animal. Toes provide added flexibility which improves footing on some awkward surfaces; they add extra degrees of freedom, and this flexibility may improve balance. Toes mean that the contact between foot and ground is capable of yielding during the step. A walker with a toeless inflexible foot would inevitably press the sharp edge of its foot on the ground while running. The poor distribution of weight at that instant would create enormous pressure which could break the ground deeply and thereby cause the machine to stumble. On a few walker models, the toes may actually have some manipulative ability. 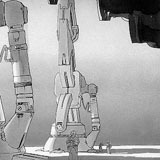 The toes of the AT-ST are tipped with wire-cutting devices, and the CAP-2 has pincers on the ends of its forward limbs. The names of walker classes are usually accompanied by an acronymn expressing the main combat role of the particular vehicle. For instance the AT-AT is an armoured transport, whereas the AT-ST is a scouting vehicle. The construction of English-language acronyms cannot be intrinsic to the STAR WARS universe, because the story is written as a translation of a tale from "a long time ago in a galaxy far far away." STAR WARS can and is translated into languages other than English, therefore English acronyms do not have any particular precedence. Within the fictional universe, the real acronyms would be written in a different alphabet and based on the spelling of the walker's long description as expressed in Galactic Basic. Unfortunately only a handful of the known walker classes presently have official names. Walker models which differ from the named examples ought to have equally distinctive names. There is a fallacious prejudice that any two-legged walker must be some kind of “scout” walker, regardless of its actual capabilities and role. 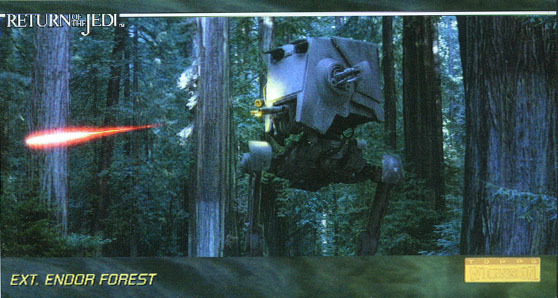 In fact most of these designs are as distinct from the AT-ST as the AT-AT or AT-PT are, and they should therefore have a designation at least as unique. Walker variants do exist, but as a general rule of thumb they should only share a name in cases where one could conceivably be made as a refit or minor modification of another. If the hypothetical conversion process is as extensive as building a fresh vehicle then they are in different classes. The Kuat Drive Yards walker designations seem to vary by only one letter at a time. We can speculate on some possibilities for the true names of presently-anonymous walker classes: AT-BT bulk transport; AT-CT command transport; AT-HT heavy transport; AT-LT light transport; AT-MT modular transport; AT-OT observer or overseer. However this document does not have the prerogative of invention; it is only an interpretive survey. Walkers that are presently anonymous are treated as anonymous in this page. The vehicles listed below already exist in the official STAR WARS literature, but it is the exclusive preserve of future official publications to name them. This massive walker is so huge that its body is almost entirely unseen in the one available image of it. Two legs are visible, and the orientation of their joints indicates that they are arranged in front and back rows. However it is quite possible that there are more than two rows of legs, since the far side and the other end of the vehicle are out of sight. The best way to scale the visible features in the walker picture is to compare the far leg and foot with the trooper standing in its shadow. He must be very close to it, because is in the shade and he's also in almost the same direction as the foot. Since he and the foot are both much closer together than the separation of either from the camera viewpoint, perspective effects are minimal. The distance from ground to the top of the footpad is 6.0m, and the foot diameter is 10.6m, excluding the four toes. The top of the ankle joint is 17m high, and the shoulder and underbelly of the walker are somewhere over 32m above the ground. Because the camera's position and distance in relation to any of the features are unknown, the distance between the walker's feet is not directly calculable, except that it must be greater than an absolute minimum of 26.8m. It would be unrealistic for 10.6m-wide feet to be truly this close together; and the overall length of the walker must be many dozens of metres long. This walker probably has at least eight times the cargo and troop capacity of an AT-AT, which only carries a single platoon of troops. With a greater number of decks as well as a greater basic deck area, the larger walker probably could hold many more; perhaps over a thousand men in comfort. Indeed it might be able to carry a number of heavy and medium walkers just as an AT-AT may carry speeder bikes. This is much more practical for large-scale invasions requiring delivery of vast numbers of troops and masses of equipment to a target zone. This walker's prime role must be very different from that of an AT-AT. Is it a siege vehicle? It must be more heavily armoured, and it is certainly large enough to mount warship-grade shields. Its interior capacity may be large enough to carry thousands of troops and numerous smaller walkers. On the downside, it is too large for deployment from a regular star destroyer. It could only be transported in huge dedicated freighters or heavier warships with vast hangar capacity, such as the Executor-class star dreadnoughts or the massive fleet carrier seen in Admiral Giel's armada. 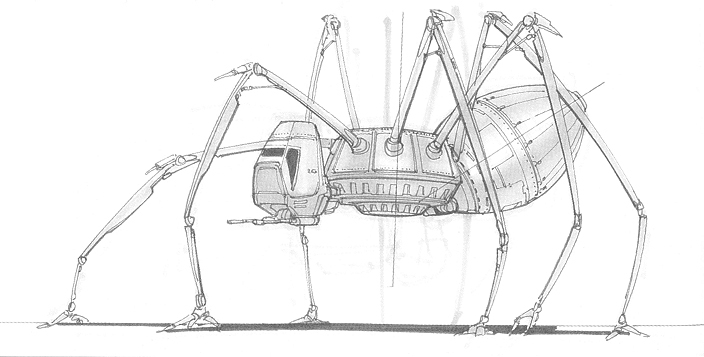 The huge walker as seen in The Art of STAR WARS Episode V: The Empire Strikes Back . 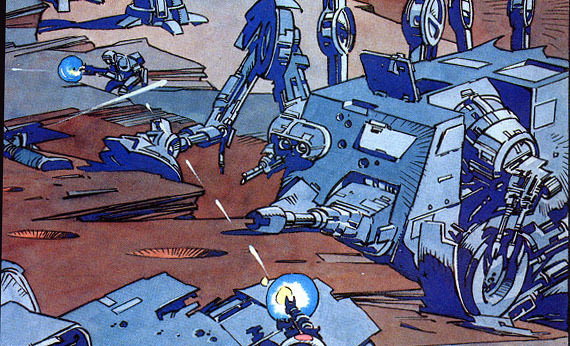 The crawler vehicle in the background is a Juggernaught, which is described in The Imperial Sourcebook . 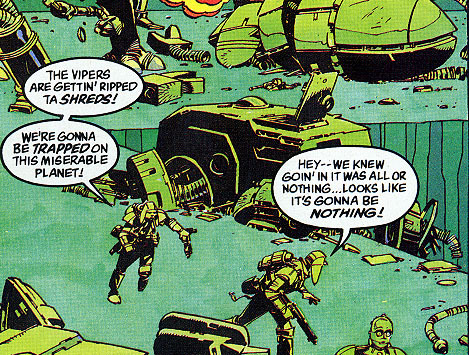 The men wear uniforms similar to those of demolitions-specialist stormtroopers in the Marvel comics series. This is another walker seen only in a single image. Like the ultra-heavy walker described above, only two legs and feet are seen. It is not even certain whether they belong to the same vehicle, because all of the body unseen above the upper edge of the picture. The orientation of the feet and legs joints indicate that the line of sight is transverse to the walker(s). If it is a single vehicle, the distance to the far foot indicates that it is very wide and it would be much more massive than an AT-AT. Otherwise, it must be of a scale comparable to an AT-AT, because the leg is higher than half an AT-AT's height. The visible portion of the far leg extends 12.5m above the ground, which is comparable to the size of an AT-AT leg. The top of the foot pad is about 3.0m high, and the diameter is 4.6m. There are no toes on the visible side of the foot. Two stormtroopers relax at the foot of a parked walker. Whether the other foot in the background belongs to the same vehicle is unknown, but the details and gross features are identical to the near foot. SIZE: at least as large as AT-AT??? 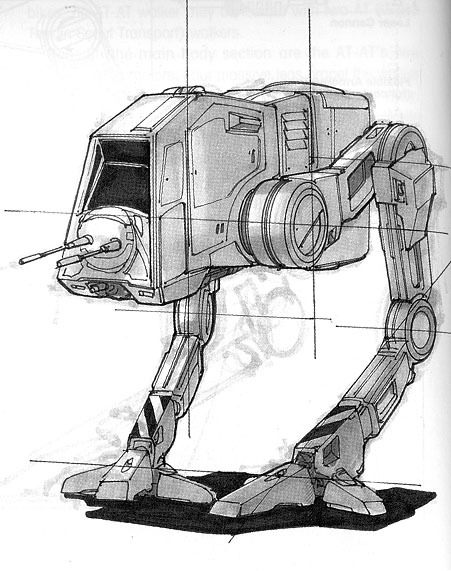 The AT-AT walker is the model seen most commonly in the STAR WARS movies, and its role seems to be roughly analogous to that of TIE fighters in space. Because it is so well documented, the AT-AT serves as a good benchmark for discussion of other walker types, without necessarily conceding it any kind of primacy. Some commentators blithely assume that it is the largest land vehicle in the inventory of the Imperial Army, but this assumption has no real justification. West End Games and derivative sources indicate a height of fifteen metres, but they do not state any justification or proof. Their number could be an arbitrary invention for all we know. 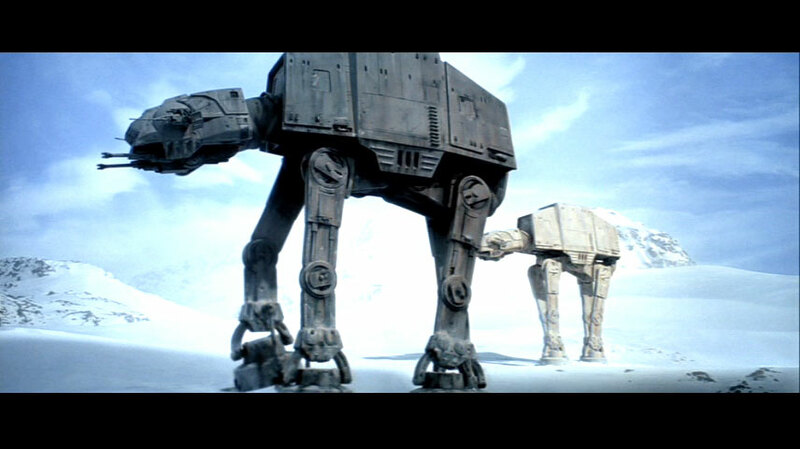 On the other hand, AT-AT walkers seem much bigger in the movies. 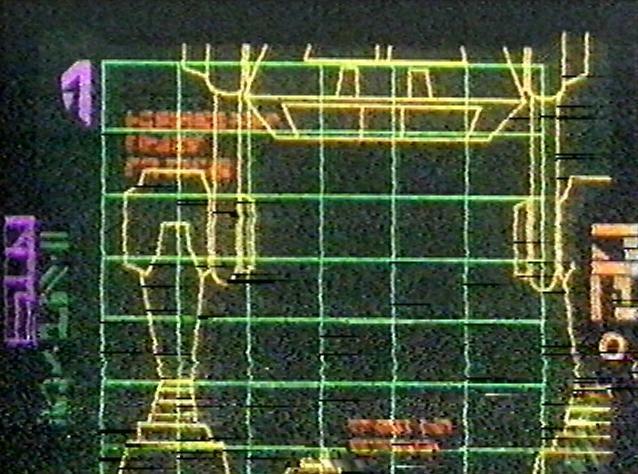 A late-stage ILM scaling diagram from the production of The Empire Strikes Back indicates a height of about 14.5m. However it's impossible to say whether this diagram reflects the final condition of the movie. 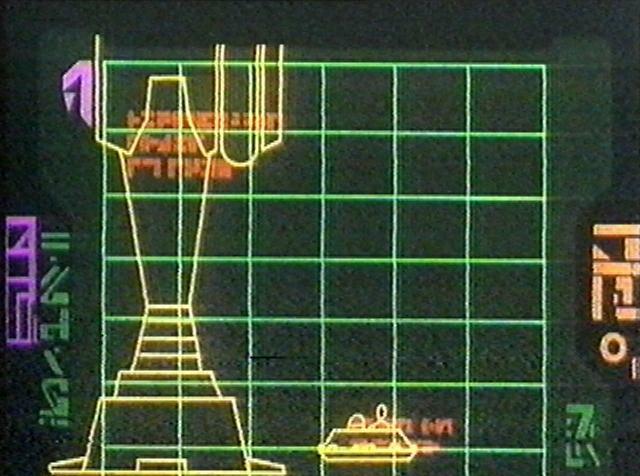 Long-range views of Luke Skywalker ascending a cable beneath an AT-AT indicate a height of 22.6m, with a precision of seven percent. Comparison of an AT-AT and the scale of the handrails of a docking platform at Endor in Return of the Jedi indicate a height of about 23m, with the rail being slightly more than 1.0m above the deck. This is consistent with architectural standards handrails on Earth. 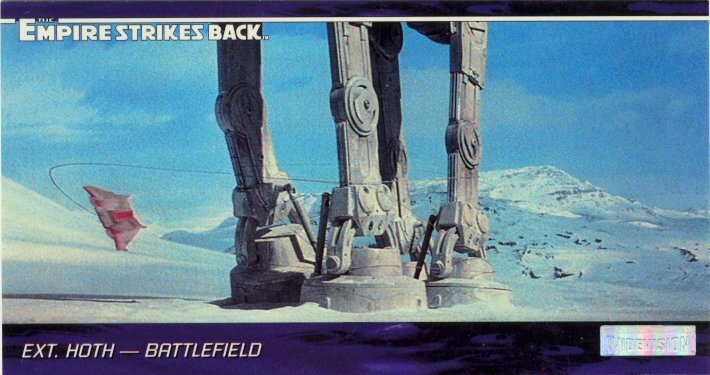 One of the walkers on Hoth managed to crush Skywalker's snowspeeder, covering most of the vehicle with the walker's footpad. If an AT-AT is about 23m tall, the foot diameter is about 4.5m. The snowspeeder's length is independently known from set blueprints: 4.53m. 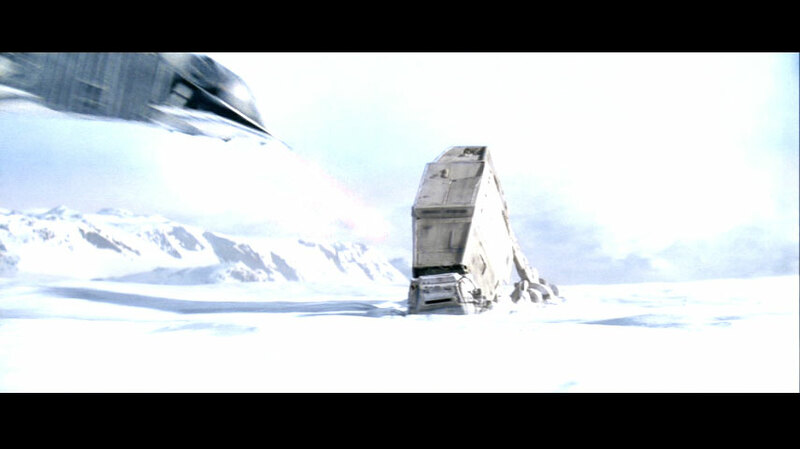 If the AT-AT was only 15m tall, it could not have covered the 'speeder as well as it did. 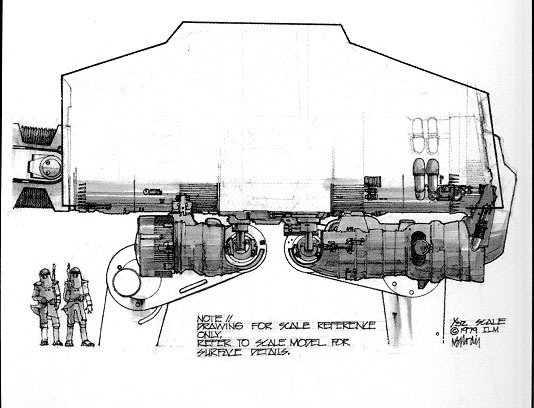 Interestingly, the length of the snowspeeder as indicated by set blueprints [ The Art of STAR WARS Episode V: The Empire Strikes Back ] is 4.5m, which would suggest that the walker foot should have covered it. However vehicles on movie sets are traditionally built underscale. Oddly, the West End Games value for the snowspeeder length is 5.5m, which supports the larger, non-WEG value walker height. A stormtrooper officer receiving orders from General Veers was able to stand and walk within the AT-AT cockpit. If the vehicle was only scaled to 15m tall, the space between floor and ceiling in the cockpit would have been no more than 1.3m. The walker must be scaled to over 20m in height in order to allow the observed cockpit scenes to fit. Observations of a snowspeeder in the act of tying an AT-AT's legs would provide another scale estimate. By initial eyeball estimates, these scenes seem to support a larger AT-AT height. 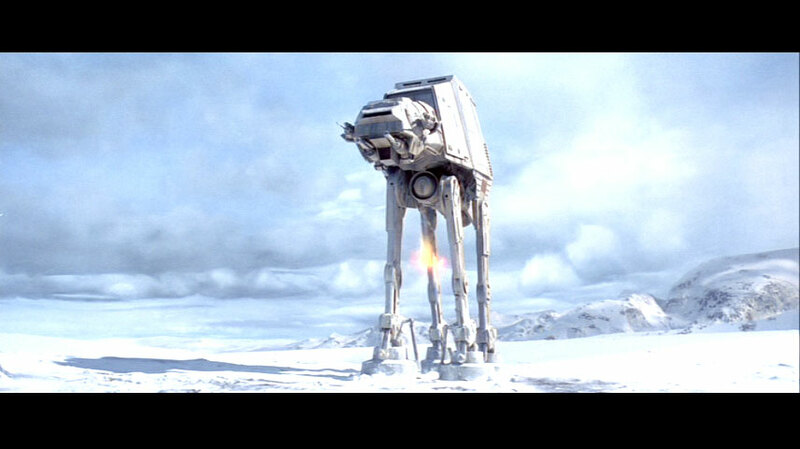 On the balance of evidence, an AT-AT walker is approximately 23m tall and 26m long. Judging by direct front views, the hull width is approximately 35% of the height, the width across the legs is about 26% of the height, and the width across the toes is about 46% of the height. 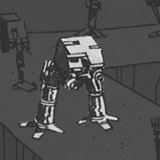 During the normal walking motion of an AT-AT, only one foot moves at a time. On flat terrain, the steps are taken in a regular sequence. When the walker is moving straight ahead, all the steps are the same length. When the walker turns or traverses uneven terrain, the step sizes vary. The top speed of an AT-AT is said to be about 60km/hr or 17m/s. At this pace the vehicle would advance by its own body length in 1.6 seconds. This is not an unreasonable level of activity considering the length of the walker's stride and the effectiveness of power sources in STAR WARS technology. 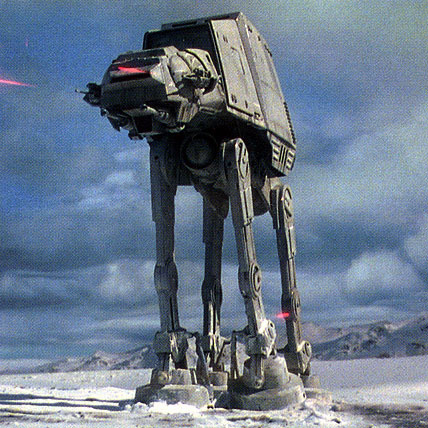 If the stride of an AT-AT is about ten metres, Each foot would make a step every 0.6s during a drive at maximum speed. If only one leg moves at a time, each entire step would have to start and finish within 0.15s. It seems most likely that a running AT-AT steps with more than one foot at a time. It is most likely that the diagonally opposite feet would move synchronously. The walkers on Hoth took steps of about ten metres every second, one foot at a time, which corresponds to about 9km/hr. This is much less than top speed. Veers' group was probably stepping cautiously across the perilous glacier, and they were distracted by the need to turn to fire upon rebel 'speeders. The maximum mobility of the leg joints is not known. 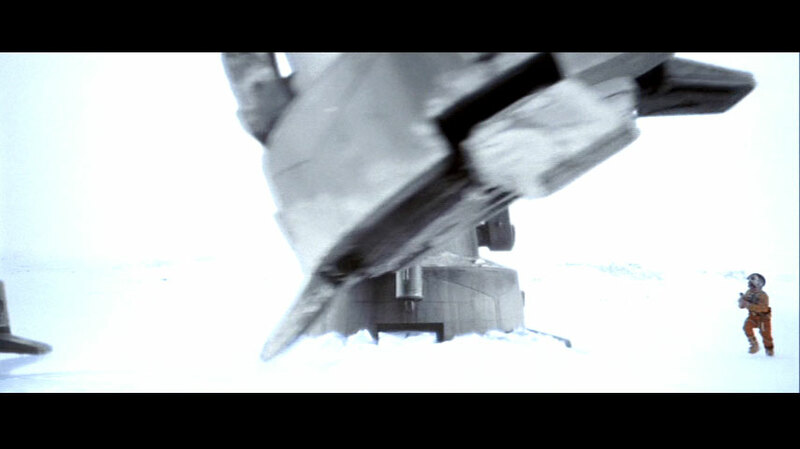 The legs can move sideways at the hip, to some extent, as shown when General Veers' walker sidestepped to blast an oncoming snowspeeder from the sky. The legs and feet possess internal hydraulic mechanisms allowing a telescoping action for shock absorption and response to uneven ground. The underside of the foot can even sink into the main body of the foot pad, as seen during the crushing of Luke Skywalker's snowspeeder. This feature is not shown in the STAR WARS Incredible Cross Sections diagrams. According to the STAR WARS Encyclopedia and earlier references from the roleplaying game, AT-AT walkers carry forty ground troops plus five speeder bikes. 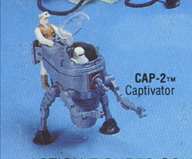 According to the STAR WARS Sourcebook , an alternative interior fit allows an AT-AT to carry two scout walkers. It's not clear how anything as large as an AT-ST could fit in the AT-AT hull, unless it is partially disassembled, so this may mean a smaller kind of walker. AT-AT walkers are reported to deploy their passengers via several different means. They supposedly can kneel to within three metres of the ground for the troops to debark via side or rear hatches. 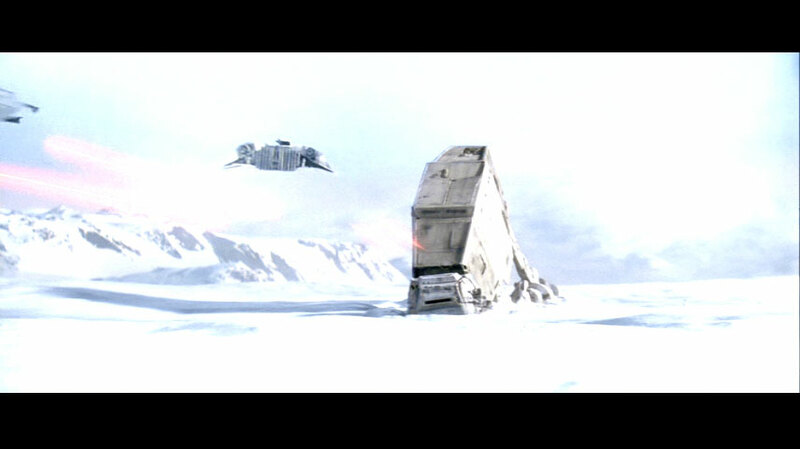 The existence of side hatches is strongly suggested by the rectangular outlines seen on the sides of the walkers, and some of these panels actually shook loose when an AT-AT tripped in The Empire Strikes Back . 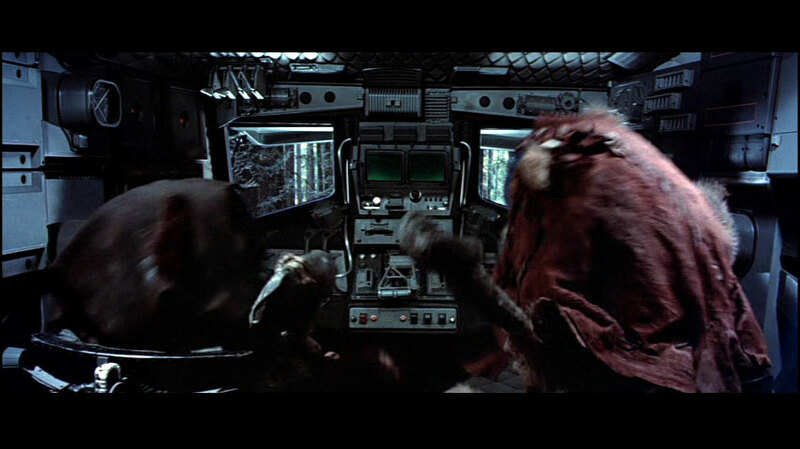 At least one side hatch was confirmed explicitly in Return of the Jedi when a walker docked at an Endor landing platform and several passengers emerged. However the existence of a rear hatch is extremely doubtful. The hind section of an AT-AT is consists of solid drive mechanisms connected to the cylindrical belly shaft. 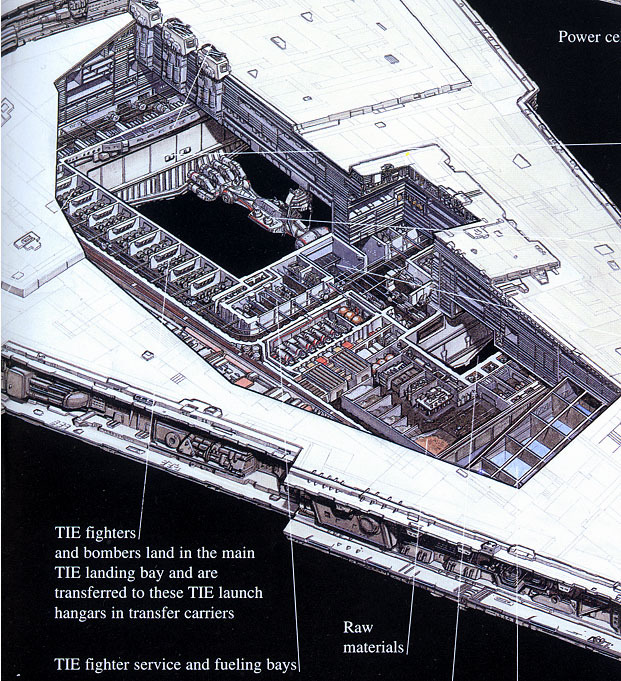 In STAR WARS Incredible Cross-Sections the cut-away diagram of the AT-AT reveals two internal decks, and that the troops riding in the body section deploy through one or more belly or side hatches. They appear to absail down a cable attached to an overhead railing. 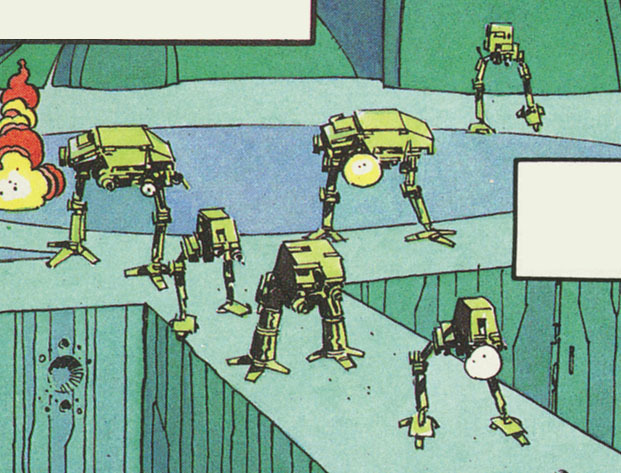 In many other representations the exiting troops march down extended ramps from the side hatches while the AT-AT is prone and temporarily immobile. In contrast the absailing procedure is quick to disgorge the men and spares the walker from vulnerability since it can occur while the machine is upright. This form of deployment probably takes precedence over the kneeling and ramp extension operation, which would be acceptable only in pacified zones. AT-AT walkers can unleash their assault forces in several rapid waves using drop-lines with attached harnesses. Boom racks extend to drop combat troops and equipment over the side. Speeder bikes are deployed using harnesses at front and back. 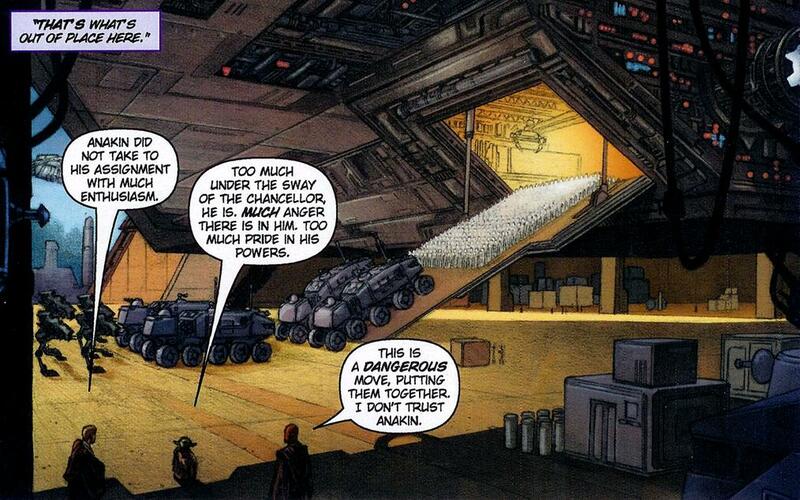 The importance of troop and cargo capacity in the AT-AT design is unclear. On the one hand, the name of the vehicle, "armoured transport", implies that the carrier role is essential. On the other hand forty troops is a mere platoon, and it is not a large number compared to the overall size of the vehicle. The troops seem to sit in spacious comfort. At the same time these walkers clearly act as front-line attack vehicles. 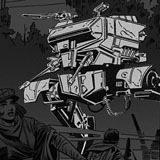 there may be larger walker vehicles in the Imperial arsenal, and they also must have the luxury of abundant deck space. It seems likely that most large walkers serve as personnel carriers to some secondary extent, because sheer size makes it easy to design habitable interior spaces. Perhaps there are other important aspects of the normal role of the AT-AT that have not yet been considered, but which might affect the standard troop complement. It may be that these walkers are intended for active, long-term, independent patrols, in which case they may need to devote considerable internal space to the platoon's supplies. Or perhaps the forty-troop complement is merely a baseline standard, with the potential to carry more. Perhaps the standard is based on the space occupied by the bulkiest, power-armoured "spacetrooper" stormtrooper specialists. When General Veers' walker fired upon the rebel power generator, at the climax of the Battle of Hoth, one of his crewmen estimated the range as "one-seven-decimal-two-eight". Metric units are standard in the STAR WARS movies, so this range is almost certainly 17.28km. Judging by the view from the walker cockpit, the generator is clearly much more distant than a few metres, tens of metres of hundreds of metres. This range is on the order of the distance to the horizon for a terrestrial planet. The higher one stands, the greater the distance to the horizon, since the line of sight passes over and around more of the planet's curvature. If the planet Hoth 6 is the same size as Earth, the view across a flat battlefield would extend up to about 16km for a viewer in a walker cockpit. If the walkers were on high ground, the horizon distance would be further: a 80m rise would extend the line-of-sight range to over 32km. Since the AT-ATs attacked over a "North Ridge", the range of 17.28km is probably just the direct line-of-sight distance just after the generator came over the horizon. This indicates that line-of-sight obstructions are the only practical limitation on the range of the AT-AT's guns, and the intrinsic range of the weapons is very much greater. This incident is a valuable benchmark for the performance of AT-AT weapons, since by Veers' command "maximum firepower" was used. The blasts at the generator seemed to involve visible bolts that were particularly long or perhaps a series of smaller bolts in very close succession. This establishes a limit on fire rate and demonstrates the appearance of maximum intensity bolts, as opposed to the ordinary shots used elsewhere. 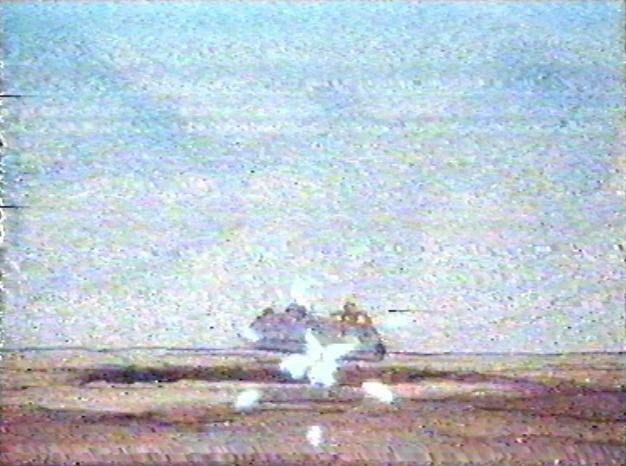 Then follows a shot in which the generator is shown exploding, with rebel soldiers in the foreground. This would enable the derivation of a very rough lower limit on the size of the generator. This minimum scale might give a hint about the AT-AT's range. The idea is untested; it will be attempted during a later revision of this page. The AT-AT has two pairs of guns, mounted on the chin and the cheeks. The heavier cannons on the chins are fixed to point in the direction of the walker's head. They therefore have more physical support, and they seem to need it. Due to some kind of recoil or another reason, the guns jerk backwards be at least half a metre when they are fired. They swing back into their normal position within less than a second. The entire lower part of the walker's head looks as if it is dedicated to suspension and power for these cannons. The side guns are on vertical turrets, allowing them to swivel upwards to fire upon targets above the walker. 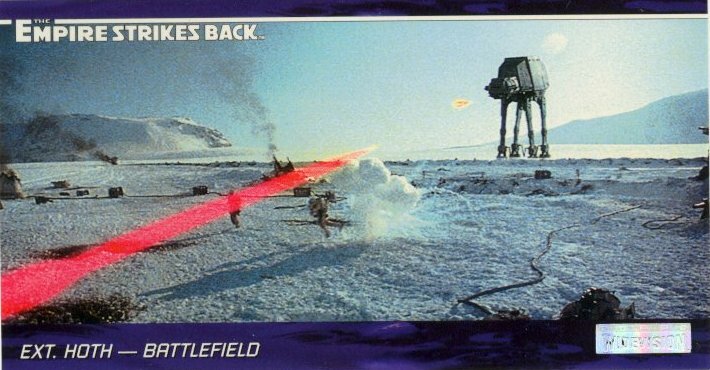 This makes the guns better suited to defending the AT-AT against hostile craft in the air. The heavy chin guns, in contrast, seem suited to obliviating slow-moving targets on the ground. 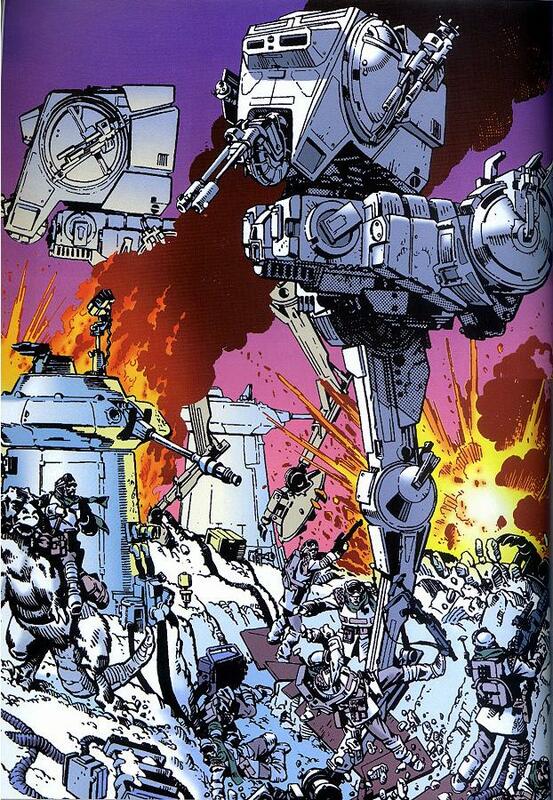 AT-AT walkers are essentially invulnerable to conventional artillery fire. Their hull surfaces absorb and dissipate blaster bolts without the vehicle feeling so much as a jolt. This supports the notion that shots from energy weapons carry very little momentum (making the bolts light-like). When less armoured materials are shot, a puff of vapourised matter expands violently away from the blast point and this can account for recoil and jolting. Kinetic effects may also result from bolt-shield interactions on a shielded vehicle, as shields may carry momentum and angular momentum. 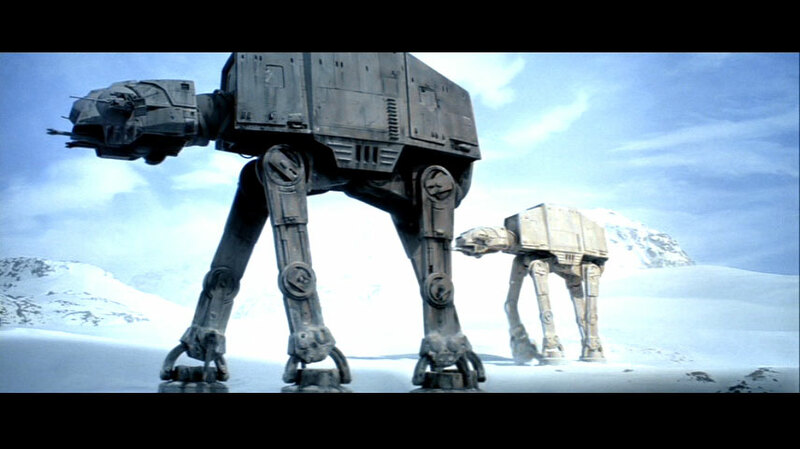 AT-AT walkers are not proven to be shielded, but they could have enough of an unarmoured veneer (eg. paint?) to account for an almost imperceptible amount of jolting under fire. Only three points of vulnerability in the AT-AT hull are known at this time. 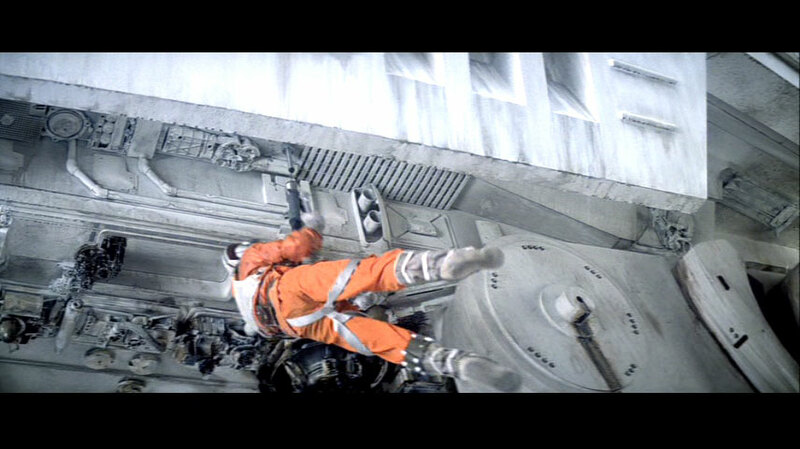 One was the hatch used by Luke Skywalker to penetrate a concussion grenade into a walker's interior. That weak spot is hidden beneath the lips of the lateral hull armour amidst the walker's drive mechanisms. The second weakness is the pair of open vents just under the armoured upper shelf of the front face of the main hull. 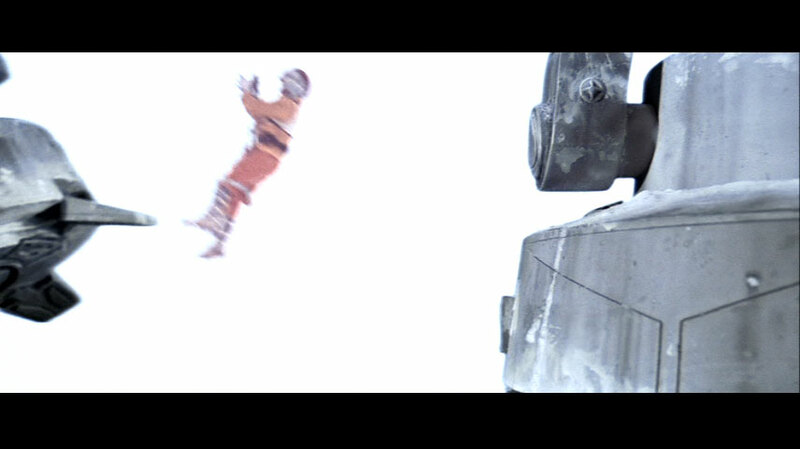 One snowspeeder on Hoth strafed and missed these vents on an upright AT-AT, before Luke Skywalker decided his trip-cable tactic. After the first walker fell, a 'speeder made a similar frontal attack without fear of the walker's head guns. 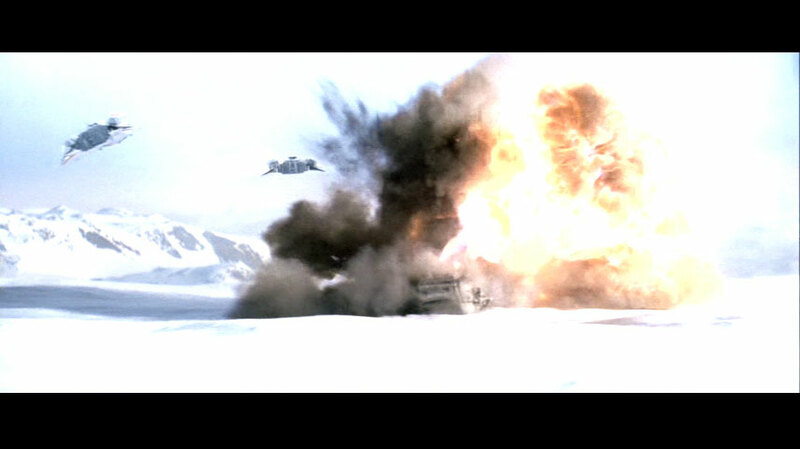 A precision blast to a (presumably unarmoured) neck section exploded the AT-AT immediately. These soft spots are probably well-known to rebel pilots, in theory if not necessarily in practice. 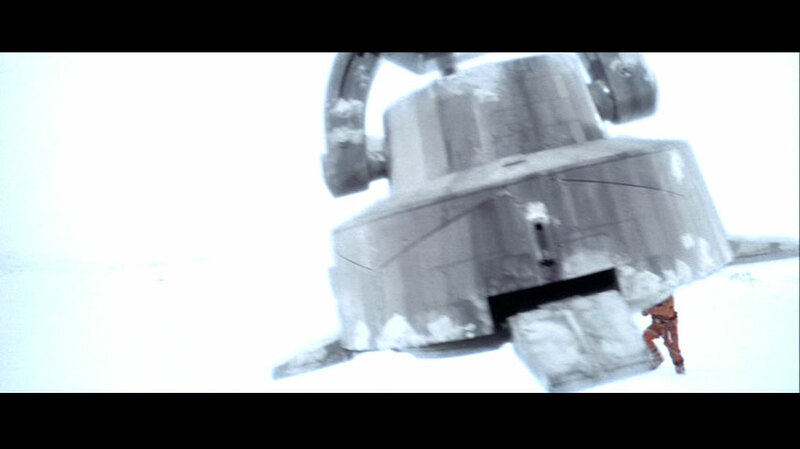 The AT-AT walkers are astonishingly resilient to enemy fire from the outside, but are easily demolished from within. This is an important clue about the nature of the armour. Its effectiveness may be directional. Or it may be essentially designed for energy attacks, with an enormous heat capacity and thermal conductivity, so absorbed blaster bolts heat a large patch of hull slightly rather than heating a localised area to the point of vapourisation (which is what happens with ordinary materials). 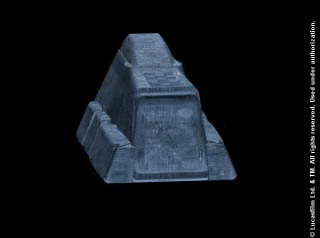 It remains uncertain whether these unusual properties are innate to the armour material, or are the result of augmentation by something akin to an energy shield suffusing the hull of an active walker. If the properties are innate to the material, then the armour may incorporate forms of matter beyond those available to modern chemistry and nucleosynthesis on Earth. 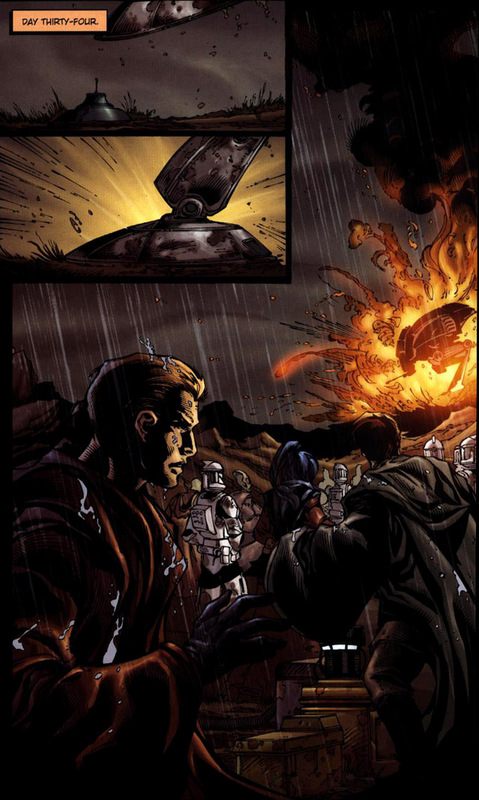 The resistance to blaster fire is not just a ray shield projected out to some distance from the surface of the vehicle, as a starship would use. If it was a ray shield, we would expect to see absorbed bolts splinter into a shower of relatively harmless daughter bolts, as is the known behaviour of ray shields in space. See also: WOTC 34mm miniature statistics. 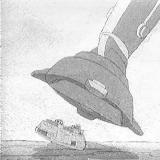 The foot of a walker descends to crush a rebel airspeeder during the Battle of Hoth. The speeder's length appears to be almost fifty percent greater than the diameter of the foot. Size comparison of a running man and AT-AT foot. AT-AT scale reference diagrams used at a late point during the production of The Empire Strikes Back . The outlines of the walker resemble the final filmed design. Luke Skywalker ascends to the underbelly of an AT-AT. Judging by Luke's known height, the AT-AT is about 23m high. 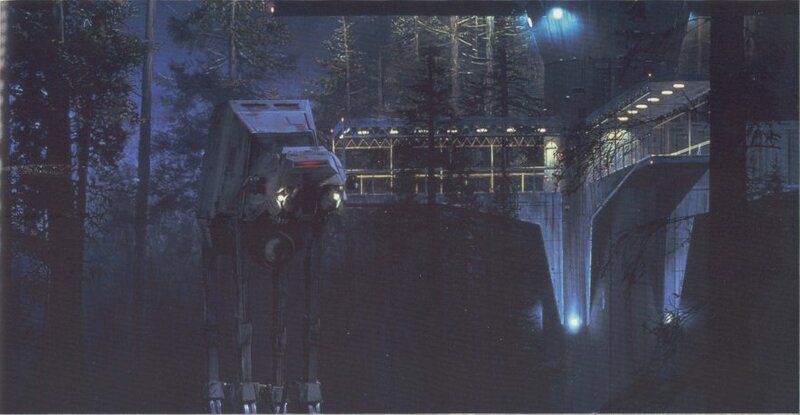 An AT-AT walker docks at a landing platform on the sanctuary moon of Endor and delivers a prisoner to Lord Vader. The scale of the walker is obvious by comparison with the handrail and other features of the platform. The crew hatch used in this incident is just forward of the ladder on the port side of the main hull. A rebel snowspeeder entangles its walker prey. The walker is closer to camera than the 'speeder but still it is clear that each foot is comparable to the entire length of the rebel craft. Rebel soldiers flee the advancing AT-AT walkers on Hoth. Since the furthest of the men is closer to camera than the nearest walker, this image proves that the walkers are over 15.5m tall. If a 23m height is assumed then the closest walker is about 1.5 times as distant as the furthest rebel. 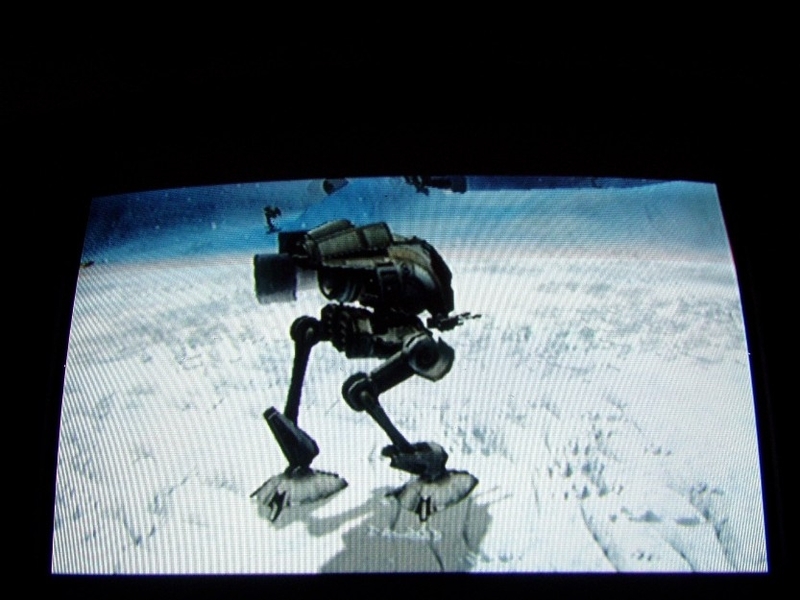 The telescoping articulation of the AT-AT foot in motion. An AT-AT command cockpit is very spacious. The crewmen are seated at the edges of the viewport, which makes it easy to appreciate and visualise their positions in external views of the walker. Deployment of troops on descent cables as indicated in STAR WARS Incredible Cross Sections . Closeup of the heavy chin cannons of the AT-AT shows their formidable support structures. Peripheral glow from the emerging blast illuminates parts of the nearby undercarriage. Energy artillary shots cause no substantial harm to the armour of an AT-AT. 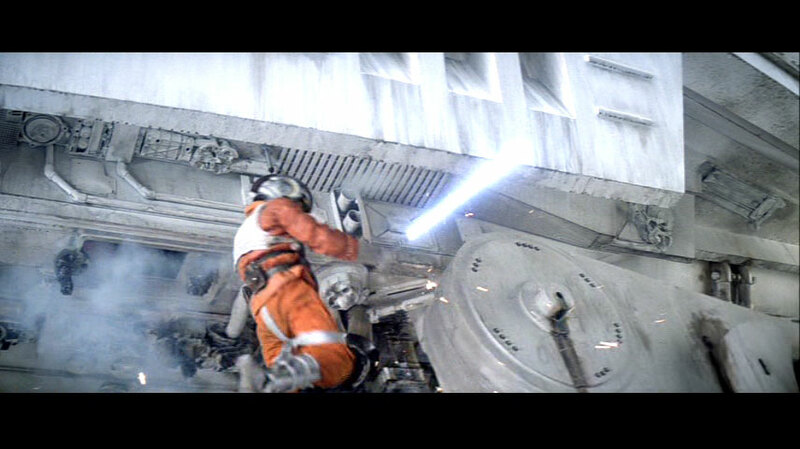 Luke Skywalker, engaged in a close-range attack on the belly of an AT-AT walker. 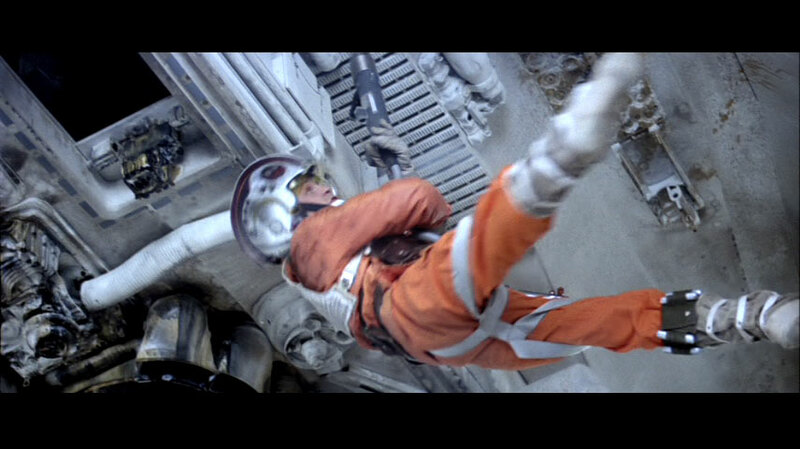 In this full-body view the explosion of Luke Skywalker's concussion grenade clarifies the location of the hatch he broke. 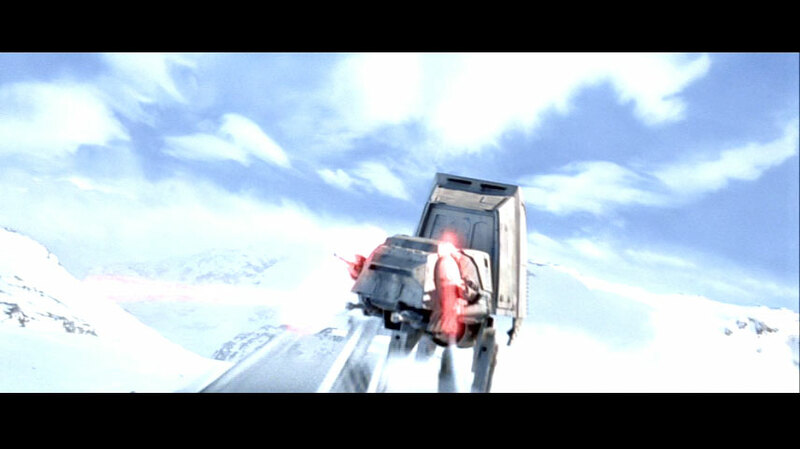 Snowspeeder flies off to the left after strafing the open forward-facing vents at the top of an AT-AT's hull. A rebel snowspeeder successfully targets the neck parts of a vulnerable walker. AT-AT walkers with their medium and heavy weapons blazing. 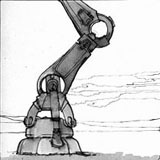 A storyboard sketch from Magic of Myth , featuring late-stage versions of Hoth vehicle details, supports the observation that the AT-AT is at least large enough for humans to stand in the cockpit. This would be impossible if the vehicle was scaled to a height of only 15m. 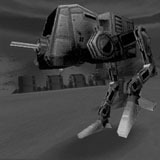 An underwater vehicle known as an "AT-AT Swimmer" was featured in the roleplaying game adventure Battle for the Golden Sun . It is described as being based on the AT-AT walker design. 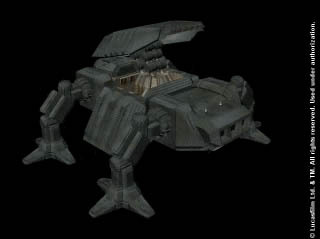 Some components around the head, neck and weapons look similar, but the hull is a completely different, flatter shape. If there is a substantial commonality in the design, it must have something to do with internal structures. 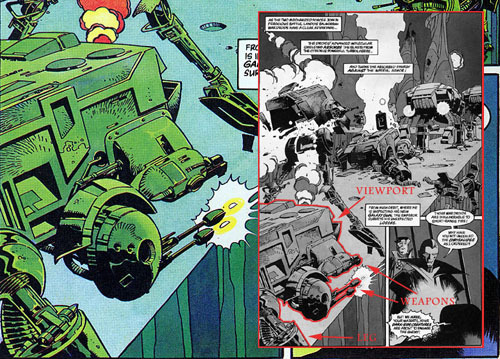 The most striking difference is that the four legs of an AT-AT walker are replaced by repulsor projectors. These devices apparently emit invisible beams of a gravitic nature, to propel the craft along. It isn't clear whether the repulsor acts directly on the surrounding water, or must touch the seabed below. The adventure game notes indicate that when the repulsors are active, the swimmer can be approached more easily from above than from below. Various views of an AT-AT swimmer from Battle for the Golden Sun . 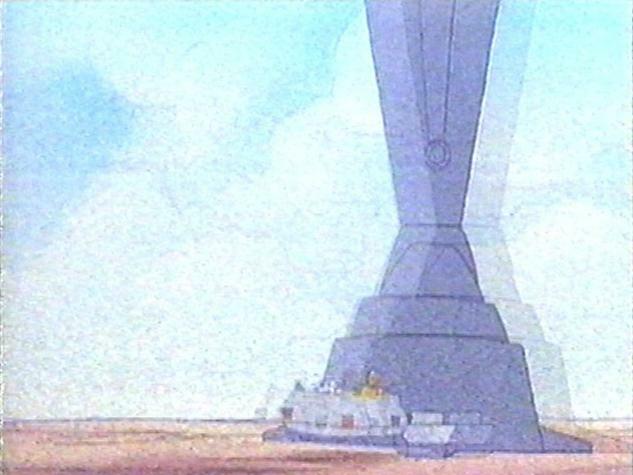 This massive bipedal walker is seen during the introduction to the Droids cartoon. 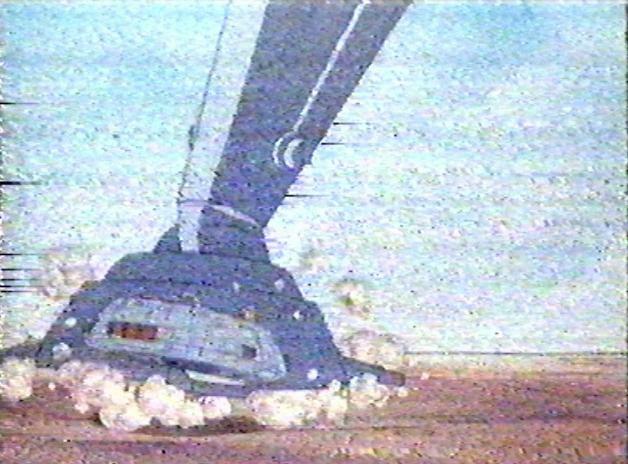 It pursued a pair of droids who were flying a rounded repulsorlift platform (similar to the kind holding several revellers in the Mos Eisley celebrations at the end of Return of the Jedi ). 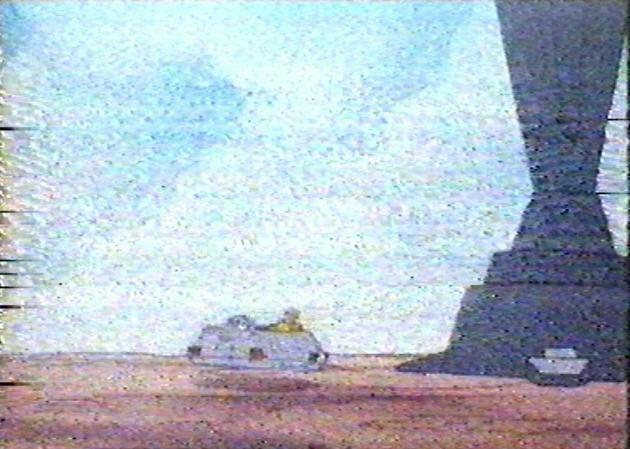 Whether this walker was under Imperial control or some other military force remains unknown, but the cartoon series setting assumes that the Emperor is alive. The body of the walker is only seen in a schematic view. However it must carry at least one blaster cannon, since it was seen firing at the droids' saucer as well as trying to step on it. The gun can fire almost directly downwards; it would appear to have a very broad arc of fire. 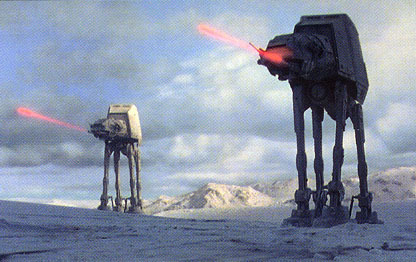 The bolts fired from the walker were red, like those of an AT-AT. 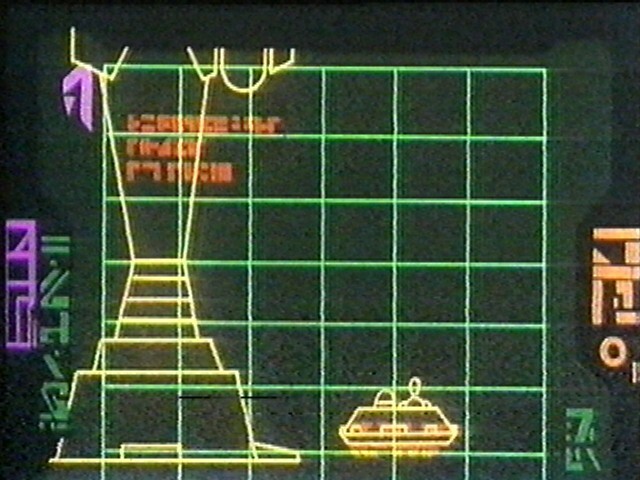 Schematic of the heavy bipedal walker and the droids' repulsorlift saucer, as apparently seen in a monitor near the action (presumably on the saucer). 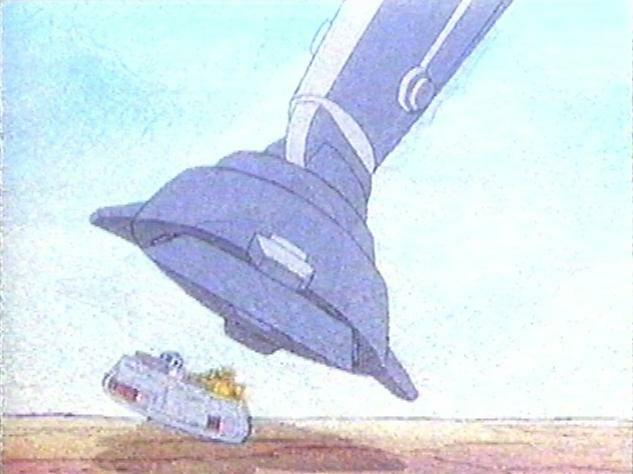 The bipedal walker attempts to blast and stomp upon the droids' saucer. STANCE: same as a pittin? Judging by the size of its visible guns, this vehicle bears at least as much firepower as an AT-AT walker, but it is less massive and has a less robust posture. 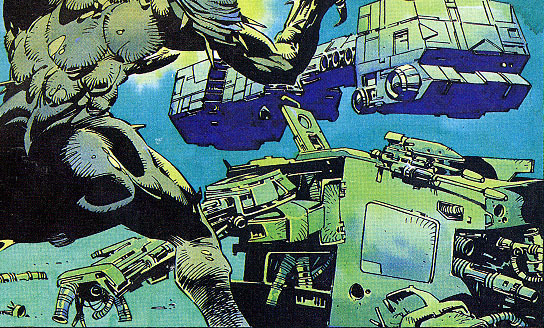 The weapons include twin chin-mounted heavy laser cannons, and what appear to be medium cannons on shoulder turrets. The three toe/claws on each limb are much longer than the feet to which they are attached. The head vaguely resembles the front portion of an AT-AT's head, and the cockpit window is wide and rectangular, indicating room for two or three crewmen sitting beside each other. The neck is short and protected by the broad-shouldered main hull. 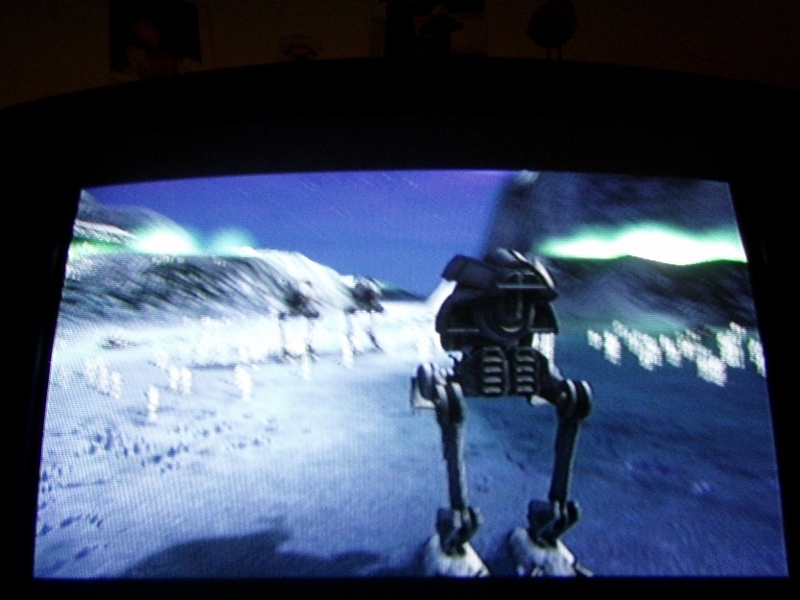 Two of these walkers were seen defending the Byss Citadel against the ground attack by the New Republic's commando forces and Balmorran war droids in Dark Empire II . 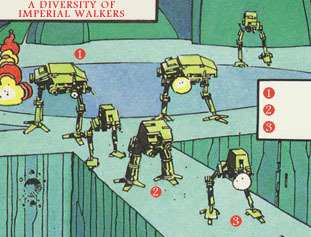 Since these examples were seen surrounded by AT-ST sized walkers, it is possible to determine strict limits on their dimensions. These medium walkers are substantially taller, such that their chin guns are high enough to fire over the heads of the lesser walkers. Nevertheless, they are significantly shorter than an AT-AT. Two of the walkers in urban battle on Byss, firing over the heads of smaller vehicles. Closeup view past the starboard shoulder: there seem to be lids sheltering the viewport. There is an obvious double blaster cannon on the side of the head, and there may be another cannon sighted further forward and closer to the viewport. The ground forces of the Empire use at least one variant AT-TE in a logistical support role. This AT-TE is unarmed and has an open top to enable it to work as cargo carrier. 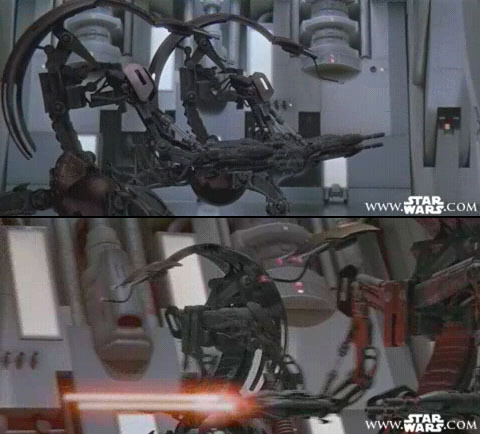 The lower hull and limbs are otherwise resemble those of the large AT-TE models that saw action in the Clone Wars. The role of this walker is similar to that of the AT-OT, although the latter is armed. The single driver sits in an open cabin. If a suitable gap is left, the rear compartments can be configured to carry passengers. 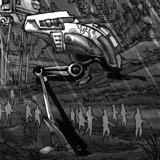 One of these walkers seen on Maridun was equipped with a cable and winch system under its chin; this machinery was strong enough to free a juggernaut that had lodged itself on a boulder. The AT-TE also had at least one cargo crane for transferring materiel to and from the topside cargo area. 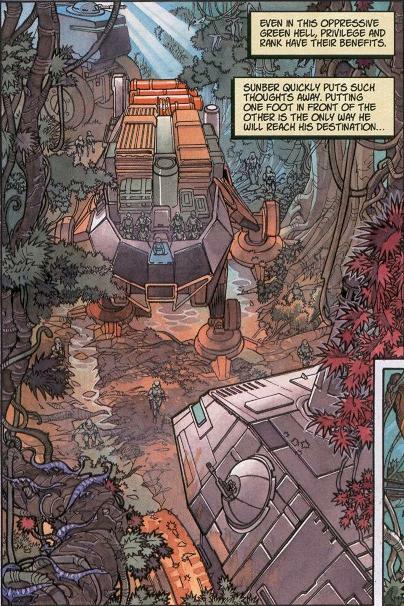 A carrier AT-TE in convoy through the jungle of Maridun, at about the time of the Battle of Yavin. First described in the computer game Force Commander and the associated online documentation. This appears to be a sturdy sprawl-legged quadrupedal walker. The wide placement of its legs ought to provide it with exceptional stability. The head and body appear to be a rigid slab without a neck. 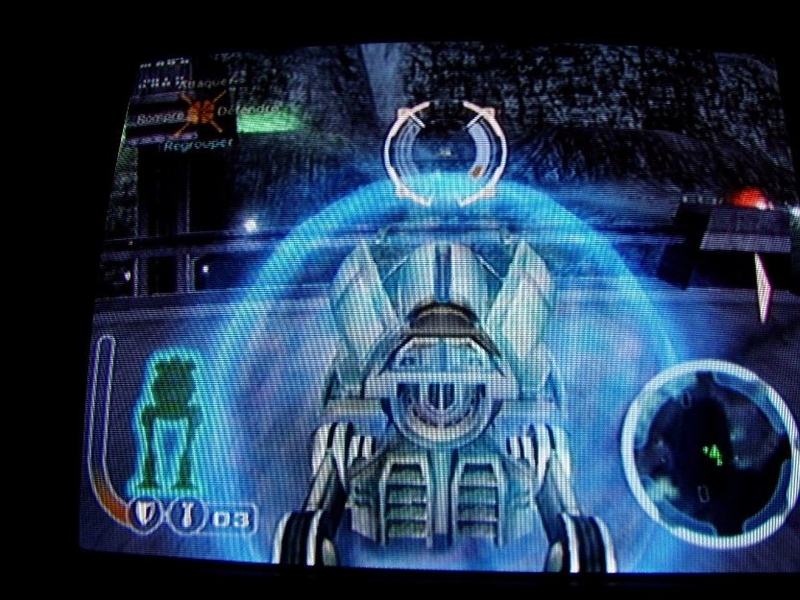 The cockpit has three forward-facing viewports mounted in an armoured block that is reminiscent of the viewport section of an AT-AT. 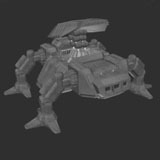 However the dominant feature of the walker is a "flak pod" mounted on a dorsal turret with flexible azimuthal articulation. The vehicle appears to be designed to counter the harrassment of walker formations by flying craft and other fast mobile enemies.. The AT-AA is an excellently plausible addition to the known range of Imperial war machines. AT-AA rendered from several different angles, as seen in the online preview documentation for Force Commander . 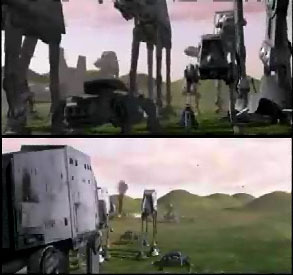 AT-AA walkers are visible in the background and mid-ground parts of these views of an armoured formation in the demo movie for Force Commander . Walker of medium height but bulky build, implying extremely heavy armour. The head and body are one boxy module, with a rectangular crew viewport on the starboard side of the front face. The two visible weapons are massive cylindrical devices with diameters approaching one metre. The crew enter and exit via a rectangular hatch on the upper hull. This walker maintains some of the dexterity inherent in bipedalism, but it trades agility for massive armour and powerful weapons. The advantage of this is that it makes a more robust war machine, which is more durable under enemy fire and more able to stride and crash through obstacles. It is an exceptionally bottom-heavy model; judging by volume, over half of the walker's weight is in its feet, legs, and drive system. The thick trunklike legs each end in three long toes for balance and spreading the walker's weight. The legs are jointed at an ankle, knee and shoulder. These joints are internal and largely hidden by the outer leg armour. It seems possible that they do not bend as far as the joints of other walkers of similar size. Each shoulder is a massive cylindrical shaft mounted so that half of it protrudes from the walker's belly, and the top half is buried in the lower rear of the hull's lateral armour. It looks as if the shoulders can pivot independently about a vertical axis, as well as rotating the leg attachement around the shaft. A few examples of this design have been seen in different parts of the literature. 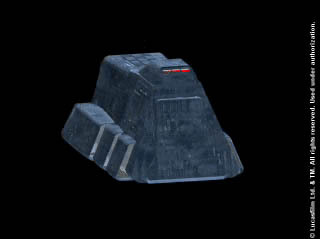 When in Dark Empire Luke Skywalker was drawn into a Force storm over Coruscant, one of the wrecked walkers lifted alongside him had a boxy body and a bulky cylindrical triple-toed foot similar to this design. 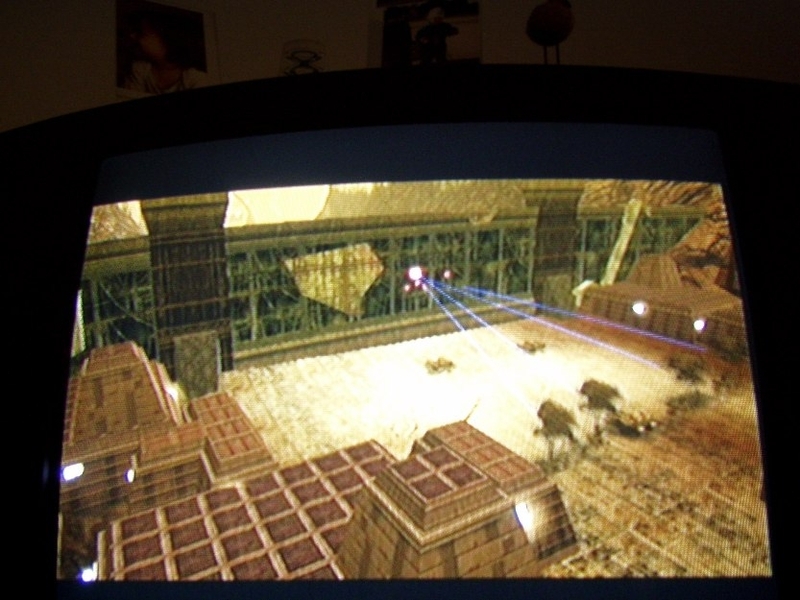 Later, the key example of the class was seen defending the Byss Citadel against the ground attack by the New Republic's commando forces and Balmorran war droids, in Dark Empire II . In the midst of other walker forces, a single example of the this stolid class marches across a bridge to face New Republic invaders. Dismembered remains of this walker are visible in the middle of the bridge. An upper crew hatch is open, with flames erupting. A heavy cannon mount is visible on the starboard side. Parts of the right leg are over the opposite precipice. The same hull, in a more advanced stage of dismemberment. The leg and body seem to be falling off different sides of the bridge. 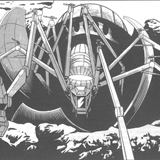 The so-called "spider walker" was developed on Carida under the orders of the planet's defacto civil ruler, Ambassador Furgan. It was first put into action seven years post-Endor when Furgan sought to abduct one of the infant grandsons of Lord Vader. 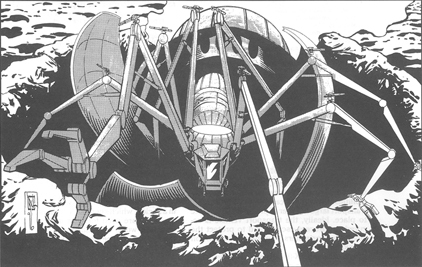 Although that mission failed, the design was disseminated to warlords of the Deep Core. The MT-AT is intended for operations requiring the traversal of seriously rugged mountainous terrains. It is much more dextrous and agile than regular walker classes, and its eight clawed legs enable it to find a very secure foothold. The greater number of limbs makes the MT-AT more trip-proof than the AT-AT, and provides better weight distribution for movement across unstable land. If the MT-AT has a disadvantage, it may be that its spindly form seems more fragile than that of other walkers of a similar mass. Its chief advantage is the ability to access ordinarily impenetrable positions, but not necessarily to act as a domineering juggernaut. This is the only known walker design to mount weapons anywhere other than the main hull and head. Each of the legs has a swivelling blaster cannon on the elbow joint. Aiming these continually moving guns must be a considerable problem, unless the gunner is aided by the semi-automated systems that drive the vehicle. (The gunner is one of only two crewmen who handle the complex machine.) The larger chin-mounted laser cannons are intended for defence against flying foes, which must mean that the head can twist upwards with considerable flexibility. MT-AT walker sketch and schematics as shown in Essential Guide to Vehicles & Vessels ; then a picture of an MT-AT in action, crawling from its landing pod. This is an extremely tall but slender bipedal walker with a proportionately large hull section. The front part of the head is dominated by a wide translucent cockpit canopy. The size of the head suggests that it may have capacity for at least a dozen passengers or the equivalent in cargo. The prime weapon is a heavy chin-mounted cannon, and no other weapons are visible. The feet, legs and stance are similar to those of the AT-AR. Two of the tall bipeds race out into the hunt after their base is alerted to the presence of rebels nearby. This lanky bipedal assault walker stands at approximately twelve metres tall. Compared to the AT-ST, this aggressive, taller machine is more heavily armoured, has a longer stride, superior gyro systems and better leg articulation allow a proportionately faster running speed. The head is almost as large as that of an AT-AT, allowing for a spacious cockpit for the two crewmen. The large space available at the back of the head might allow for a significant cargo capacity, a squad of ground troops or expeditionary passengers, or facilities for the comfort of the crew on prolonged missions. The foot claws lack the wire-cutting mechanism of an AT-ST. The primary weapon of this vehicle is a single massive chin-mounted heavy blaster cannon. The fire arc of the cannon is not wide, so the walker must swivel its head or turn bodily to face its targets. Annotations on some copies of the design sketch [from TESB Sketchbook , intended for Battle of Hoth] indicate that it might have been operable as a one-man vehicle. 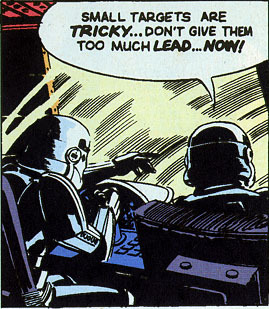 However [as comics show] there is plenty of space at the cockpit console for an extra co-pilot or passenger to sit beside the necessary crewman. 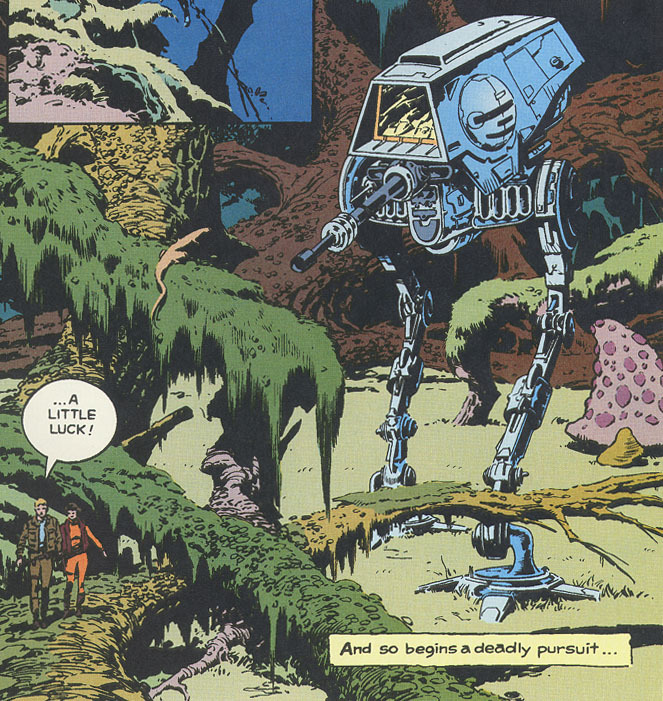 The walker encountered by Princess Leia and Luke Skywalker in the jungles of an Imperial training planet was manned by one pilot/gunner trainee and his instructor. Known deployment includes jungle, forest, glacier terrains; and the walker existed at least as early as one year post-Yavin. One of these walkers accidentally encountered Luke Skywalker and Princess Leia on a nameless world that was used as a training ground for Imperial troops and walker personnel. Before the Battle of Yavin, the expanding Imperial garrison in Mos Eisley included some AT-AR walkers; some more of these vehicles were also represented in the Battle of Hoth [ ITW:SWT ]. Bipedal assault walker designed for The Empire Strikes Back but left unfilmed (at least for now). An AT-AR walker on jungle patrol discovers a pair of rebel intruders. The walker lurches across a clearing in pursuit of its prey. The enormous stride of this particular model provides fast and efficient travel over open land. The cockpit of this walker has room for at least one crewman and his instructor. In the later stages of the Clone Wars, Master Yoda brought reinforcements to battle Separatist invaders on Kashyyyk. His forces included a kind of large, long-bodied bipedal walker. The legs are articulated like those of an AT-AR or AT-ST; the toes are clawed like an AT-ST's. The two crewman sit one in front of the other, in a long double cockpit with a transparent canpoy that ought to provide good situational awareness (at the cost of vulnerability). The main weapon appears to be a double-barrelled blaster on the chin, there appear to be two smaller guns on wings to the sides. Judging by the scale of the clone troopers depicted in the wide-angle images, this walker is somewhat more thant 10m tall. However its body is more voluminous than other walkers of similar height. 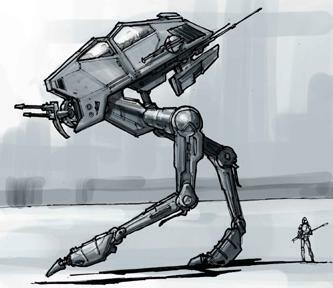 Concept artwork of a bipedal walker used in the Clone Wars [ The Art of Star Wars: Revenge of the Sith ]. Medium-sized bipedal walkers prepared for action on Kashyyyk. 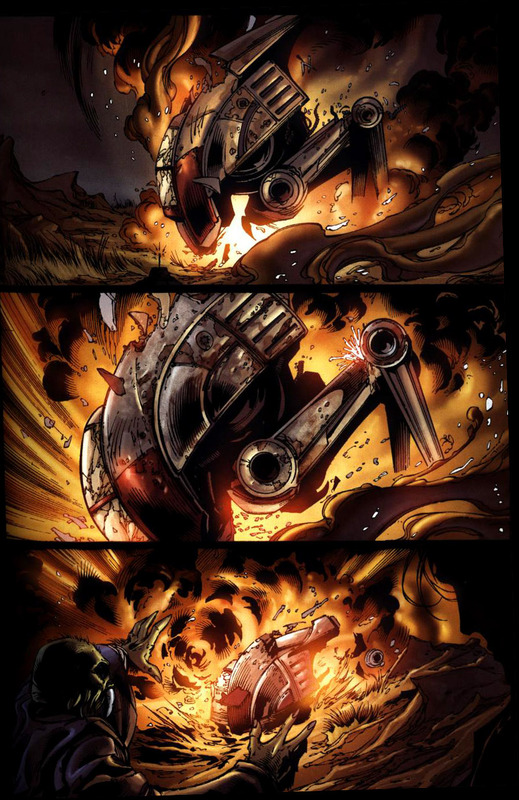 [ Revenge of the Sith comic]. This tall bipedal walker design shares many of its basic features and proportions with the AT-AR. It has a similar heavy chin-mounted cannon, but there are two additional large weapons mounted on rounded swivel turrets on the sides of the head. Otherwise the head is much the same. 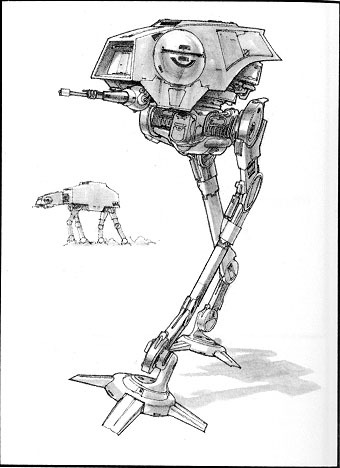 The undercarriage and legs are similar, but the general stance is less upright and the lower leg section appears to have shorter and has an extra ankle joint, more like the AT-ST. The feet have not yet been pictured. 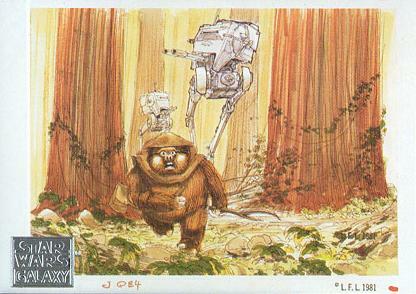 Walker on a patrol through the jungles of Cilpar, shortly after the Battle of Endor. This medium bipedal walker design is distinguished by its open panoramic cabin windows, long tail section and aft secondary observation post. Two rotating floodlights are fitted onto the front and back ends of the body. The legs are study and the feet are four-toed like scaled-down versions of AT-AT limbs. The walker can squat to the point where the undercarriage is only slightly more than two metres above ground. 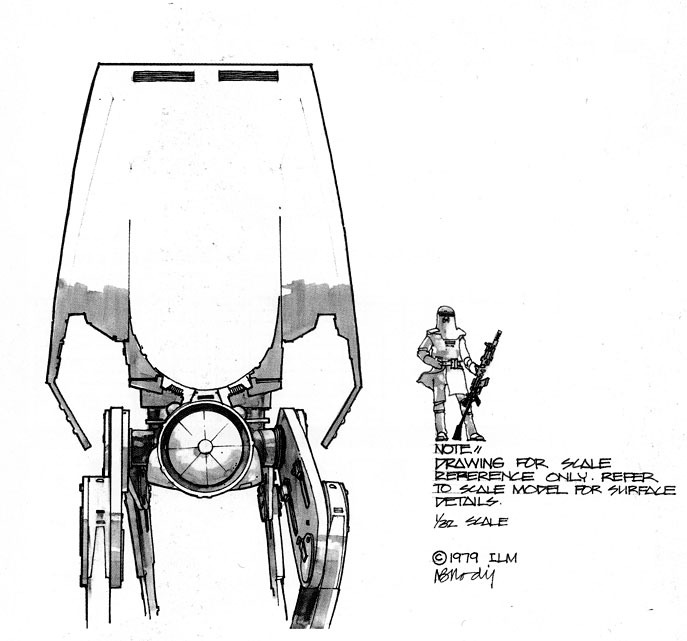 According to the annotations on the The Empire Strikes Back design sketch, this is an older model of scout walker. A scout or observational role is consistent with the weak weaponry, extensive viewports and consequently modest battleworthiness. A two-man bipedal walker design with a spacious cabin. 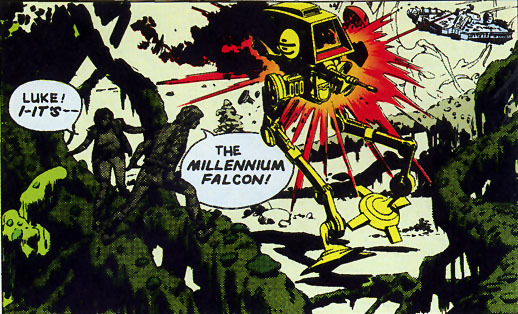 It has also been claimed (dubiously) that the AT-XT is an ancestor of the AT-ST. In engineering terms this cannot be true, since there two designs do not have any significant parts in common. The AT-XT was certainly designed for the conditions of its era, and not merely as a step towards an anticipated successor. (The suggestion of a familiar relation between walkers is nothing more than a metaphor combined with hindsight!) The vehicles share broad similarities, but there are particular structural and functional differences that imply sublty different battlefield roles. The AT-XT can be driven by just one crewman, but the availability of passenger space is unknown. The armament consists of a double laser canon under the cockpit, and two grenade launchers on the top of the head. The launchers are considerably larger than the one on an AT-ST. The most peculiar feature of the AT-XT (at least some of them) is a deflector shield resembling those mounted in destroyer droids. This shield can only be activated briefly. Perhaps the provision of a shield implies that the AT-XT, despite its small size, is expected to endure barrages of heavier enemies? It appears better suited to front-line warfare than the typical scout role of an AT-ST.
AT-XT and AT-TE in action on Raxus Prime. 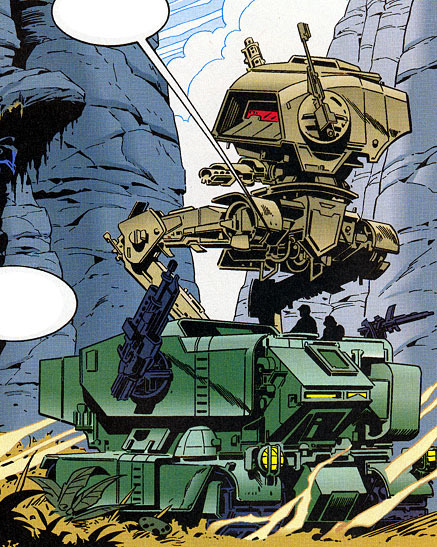 The biped stands very much higher than the AT-TE, which benefits visibility despite lower raw firepower. It is probably taller than an AT-ST too. Close view of the left side of an AT-XT (left midground, facing left). 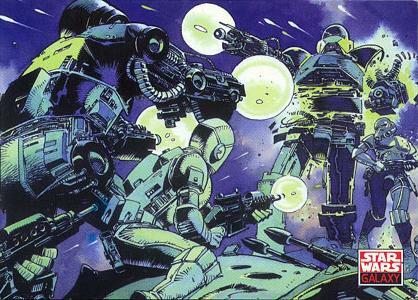 Several AT-XT walkers are firing against a wall. The bolts in their blaster beams are blue. 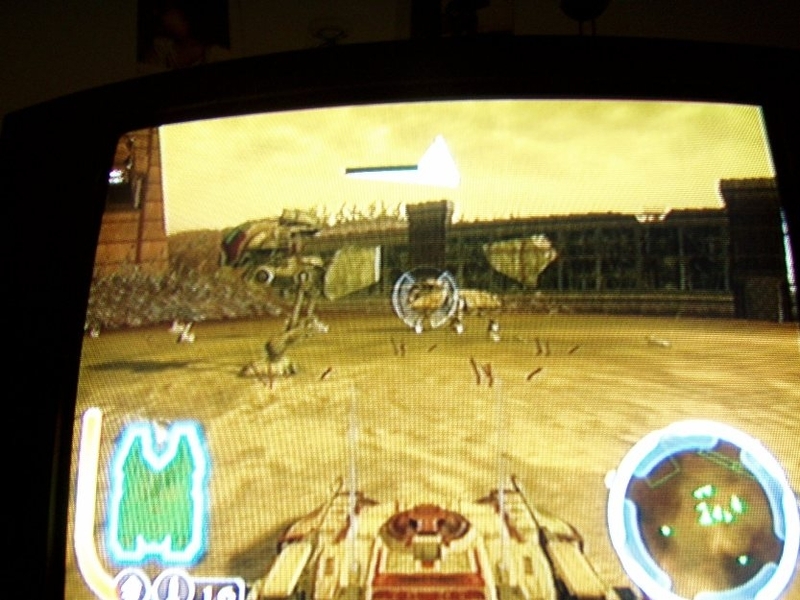 Close view of an AT-XT piloted by Anakin Skywalker on Rhen Var. The double laser canon is clearly visible in silhouette. AT-XTs in action on Thule. Two rectangular rear vents may indicate roughly where the engine is located. This AT-XT is piloted by Mace Windu. The blue “aura” around the walker is the deflector shield. 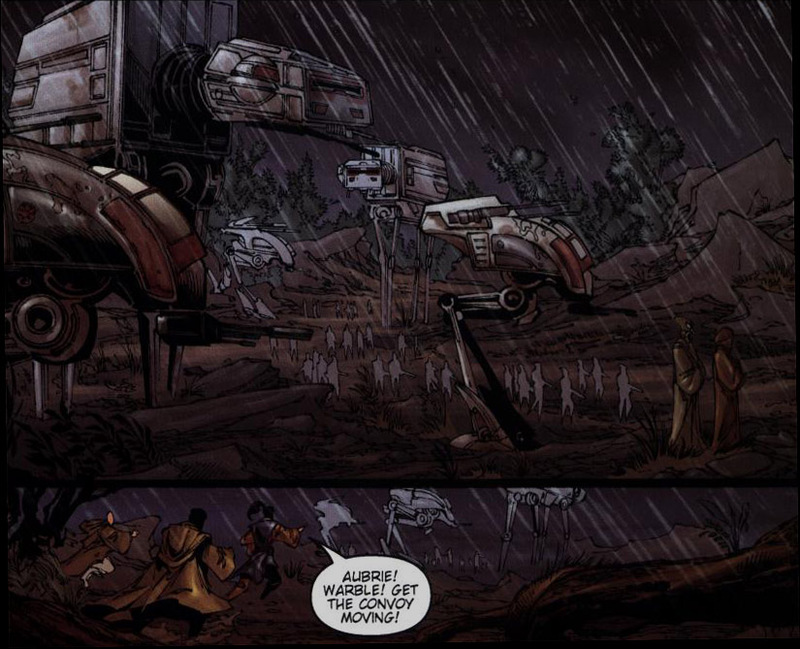 AT-XT walkers among other walkers (AT-TEs and old-model AT-ATs) on campaign in the mud of Jabiim. One of the AT-XT walkers on Jabiim steps on a land mine. Apparently there was no shield active or able to protect it. 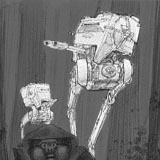 The Essential Guide to Vehicles & Vessels names a close variant of the AT-ST that has a superior ambulatory and balance system, with stronger legs, a height of over ten metres and a larger main weapon on the chin mount. 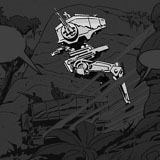 One of the observed walker models has a head cabin in the AT-ST style but longer legs and a more nimble attitude. 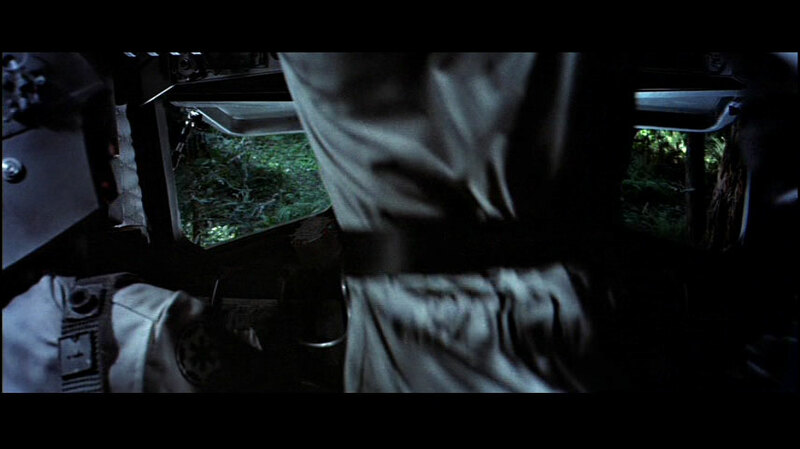 This vehicle deserves to be identified with the published All Terrain Scout Transport/Assault (AT-ST/As) designation. A bipedal walker model that is somewhat taller, more slender and articulate than an AT-ST, under attack from Ewoks. 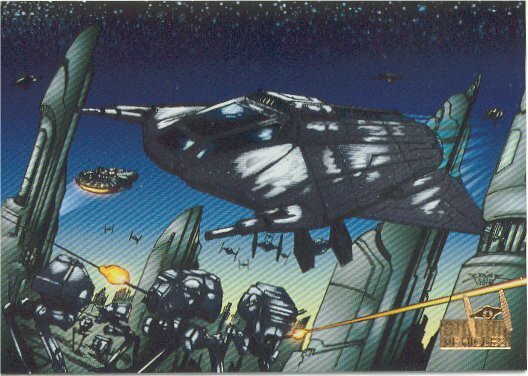 Several of the tall walkers in action on Coruscant, as rendered on the Howlrunner card of Topps' STAR WARS Vehicles series. The two-man AT-ST walker guards the flanks of formations of larger walkers, provides infantry support, or conducts long-range scout patrol. Several variants exist, with minor changes to the weapons and cockpit viewports. In temperature climates on worlds with hospitable atmospheres, a version with open-air viewport hatches may be used. 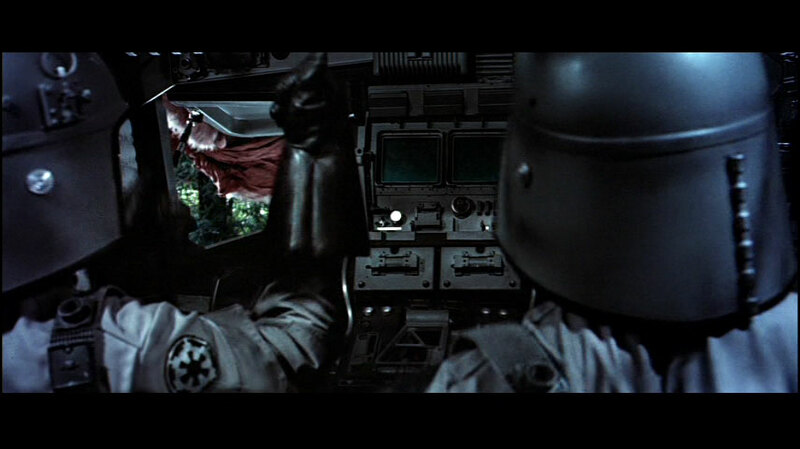 In more hostile environments, there is an AT-ST variant with airtight cockpit and sealed viewport windows like those of an AT-AT. Like the AT-AT, the size of the AT-ST is controversial. 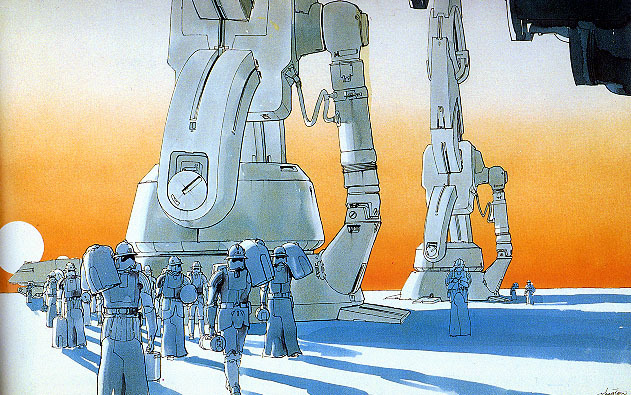 There is a scale reference diagram in the production art of Return of the Jedi indicating a height of 20'6" or 6.25m. 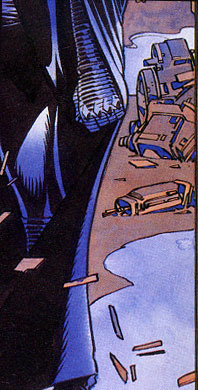 The graphic novel Jedi Knight indicates a height of about 7m. Roleplaying game sources state a height of 8.6m, also without giving evidence. The blueprints for the life-sized exterior prop used in Return of the Jedi state a height of 320", which equals 8.13m. So far this is the evidence most consistent with the final version of the film. 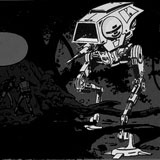 It has been suggested that AT-ST walkers may have some form of shielding, because of their observed resistance to their own kind of weapons. 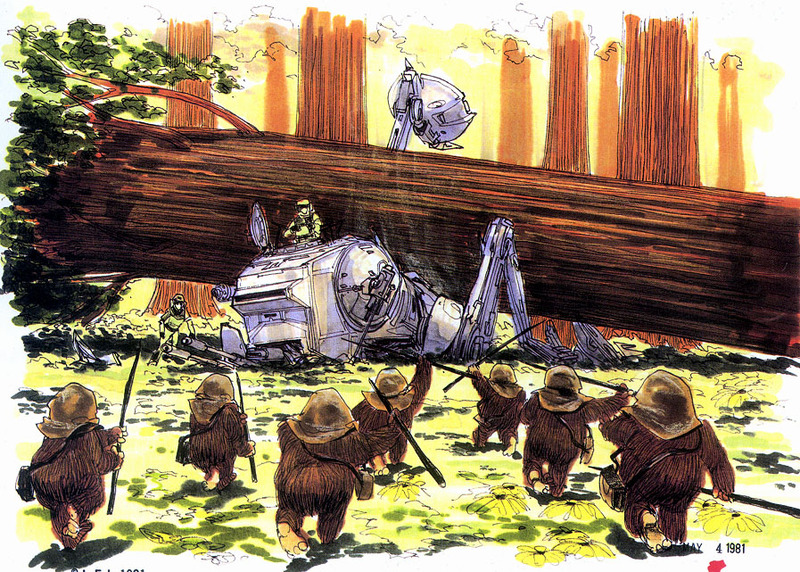 When Chewbacca hijacked an AT-ST one Endor and used it against another walker it took more than one shot to destroy the target's cabin section. However this observation is indecisive because the damaged area was out of camera sight. It may have taken several shots to penetrate the armour. The final blast may have been due to an explosion of the walker's power cells. In any case, this incident is an excellent demonstration of the comparison between firepower and durability in smaller walkers, whether the protection involves ray shielding, armour or some kind of intermediate technology. 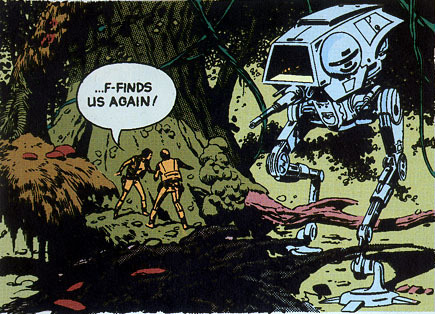 Following the hijacking, there was evidence of what may be another important function of the AT-ST. Imperial stormtroopers fighting in the forest appeared to experience a sudden reduction in their effectiveness immediately after the walkers were destroyed. 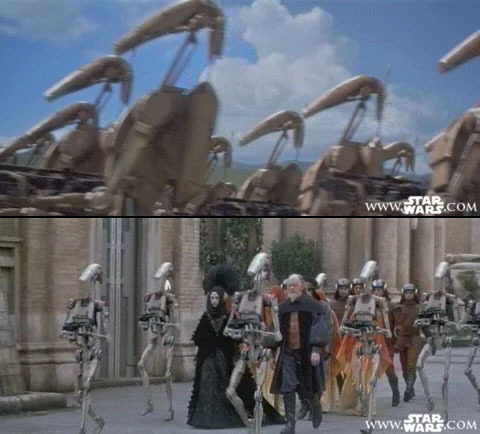 This may have been just coincidence or a failure of morale, but the incidents seen onscreen do not appear to have any causal connection to the absence of walkers. It may be that the scout walkers used their scanners to gather and transmit tactical information and orders coordinating the infantry. Loss of such a data stream and situational awareness may have made it easier for the helmet-wearing men to be ambushed. 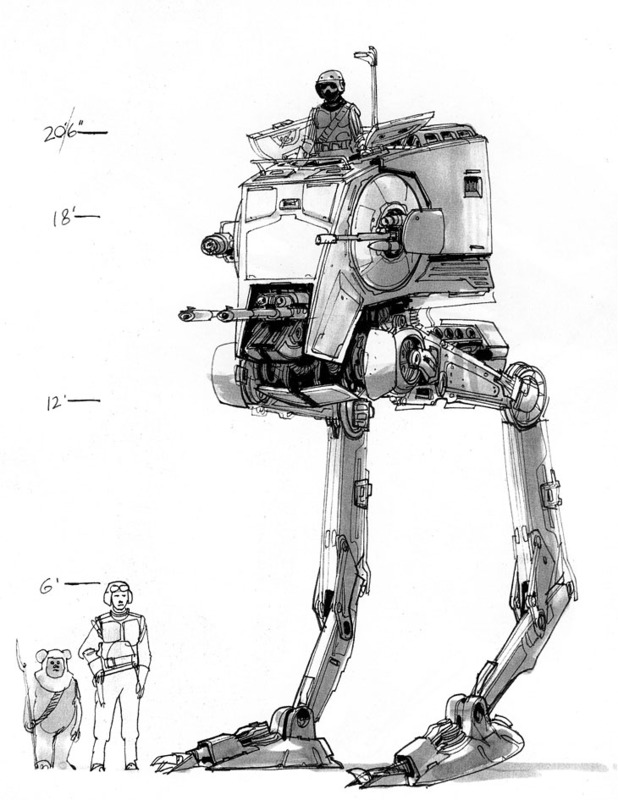 Scale reference diagram for the AT-ST walker in Return of the Jedi . The exact height of this interpretation of the walker is 20'6", or 6.25m. Final AT-ST blueprints for Return of the Jedi , from which the life-sized prop was created. The details are barely readable, but the height is 320"=8.13m. AT-ST model front and side views. AT-ST walkers in action striding across the glaciers of Hoth and firing upon the rebellious natives of Endor. Unit emblem of an AT-ST stationed at the secret Endor garrison. This icon is surprisingly similar to the logo of the pirates of Tarnoonga [in the Droids cartoon series]. 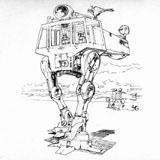 AT-ST sketch for The Empire Strikes Back . The hatches on the front face of the walker have been replaced by a transparisteel viewport module. This is probably a common fitting for scout walkers deployed on worlds with inhospitable atmospheric conditions. 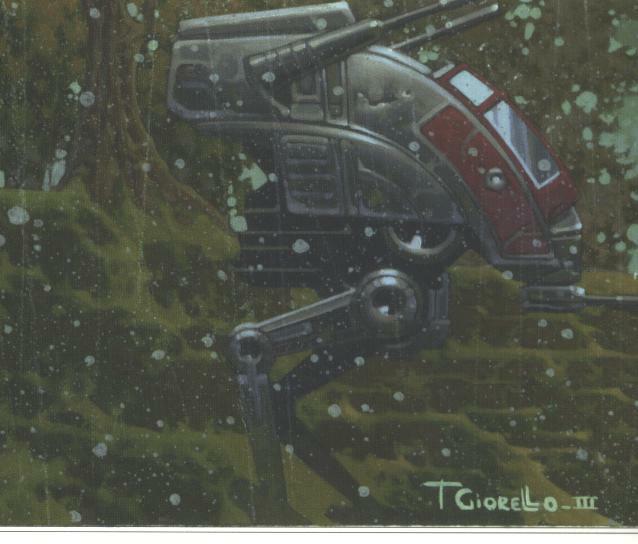 AT-ST variant with closed viewports engaged in the Battle of Hoth, as drawn for STAR WARS Galaxy II trading cards. The nearest walker scales to 8.4m tall, which is within the acceptable range considering its momentary posture. A ground battle from the Galactic Civil War, as depicted in Rebel Alliance Sourcebook . 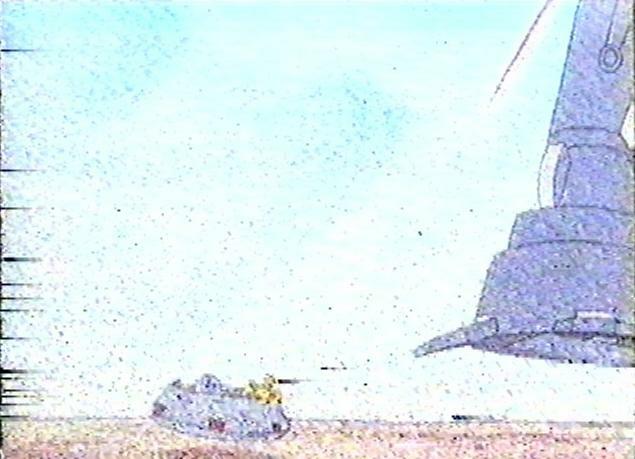 AT-ST models with the enclosed viewport module appear in foreground and middle range. 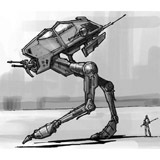 This is another bipedal walker similar to the AT-ST scout walker in terms of shape and scale. The leg and gyro systems of the two designs are almost identical. However this model's foot-pads bear two extra claws on either side, allowing for improved balance and slightly more flexibly of foot placement. The claws may also provide better bracing when the walker fires its weapons. Unlike the AT-ST, this is not a mere scout vehicle; The weaponry is considerably heavier. 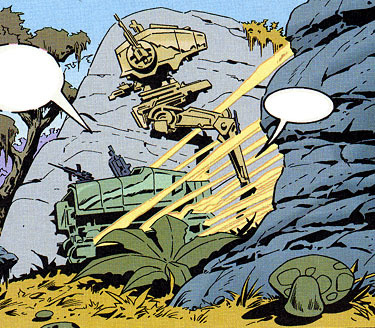 The side-mounted blaster and grenade launcher of the AT-ST are absent. The starboard gun is replaced by a diminutive vertical turret gun. The main armament is a large forward-facing vertical turret weapon. This weapon sits in a broad vertical slot running up the starboard side of the front face of the head, and can presumably angle up and down. The nature of the gun is unknown at this time; it may be a medium blaster cannon or missile launcher. In any case, its size is impressive compared to the dimensions of the whole head cabin. The weapon's size dominates the hull, possibly reducing the amount of room available in the cockpit. This could be a single-pilot vehicle, which might require the superior concentration and multi-tasking skills. Alternatively, the walker may rely upon a greater degree of automation and a more advanced and expensive pilot control interface. The examples seen on Byss were probably crewed by members of Palpatine's Royal Guard. No viewports are visible in present images. There may be a viewport which is too small to discern on present images; one of the AT-ST viewport panels would be difficult to see. If there is a true lack of open viewports then perhaps it is connected with the functioning of the prime weapon. Perhaps the weapon produces radioactive wastes, a high-energy backwash or other byproducts which preclude open windows like those of an AT-ST scout walker. At least four examples of this walker were deployed by the forces of the Byss Citadel during the Battle of Byss. A few met the New Republic war droids before they reached the Citadel, and three more stood amongst the last mechanised defenders of the fortress. Three of the light but impressively armed walkers stride out in defence of the Emperor's citadel. 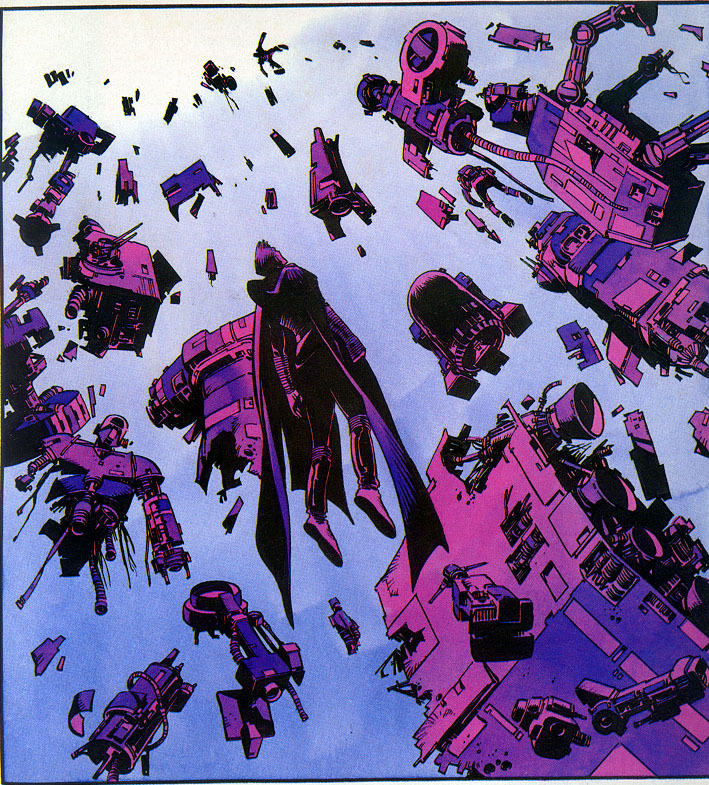 The clawed walker is in the upper left, exploding. There seems to be at least one lesser blaster on the starboard side of the head, which is invisible in the longer-range views. This design is slightly shorter than the AT-ST; the legs and drive section are much the same, but the cabin seems to be slimmed. The number of crew may be reduced from two to one. There are two chin-mounted cannons, and what seems to be one anti-personnel repeating blaster mounted on the roof. There is a single, wide, narrow viewport. Light bipedal walker in action against unallied rebels and representatives of the New republic on the planet Cilpar, shortly after the Battle of Endor. According to Dark Force Rising , this is a one-man military walker design used during the waning years of the Old Republic. The Imperial-era manufacturer has not been identified. It seems to have entered galaxywide though not ubiquitous use, since a version of the AT-PT appears in Imperial use in some recent LucasArts computer games. The AT-PT is not large or powerful enough to pose much threat to regular military vehicles. It would seem to be most effective in a direct anti-infantry role, since it has a single crewman and places him on a level not much higher than the eye level of footsoldiers. The operator of an AT-PT could be regarded as being just one step above a user of power armour, as the machine allows him access to the same kinds of spaces as an ordinary solider would occupy, whilst offering physical protection and somewhat greater speed and agility. According to Essential Guide to Vehicles & Vessels , the AT-PT was originally intended to give a single man the effectiveness of an entire squad. An AT-PT platoon would have more power than a regular infantry company. The AT-PT has superior agility and stability than an AT-ST, and can negotiate more rugged terrain. It can also change stance, going into a “half-crouch” in confined conditions or raising the main hull for faster upright striding. The crewman accesses the vehicle through a side hatch above the shoulder. The forward viewport of the cockpit is proportionately large compared to the style of more modern military walkers. This may be a sign that the AT-PT was never intended to wade directly into the fire of vehicle-scale weapons. 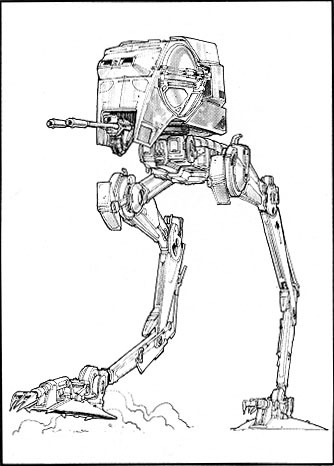 AT-PT walker as depicted in Essential Guide to Vehicles & Vessels . Imperial AT-PT walkers at an inventory depot under attack from Rogue Squadron. 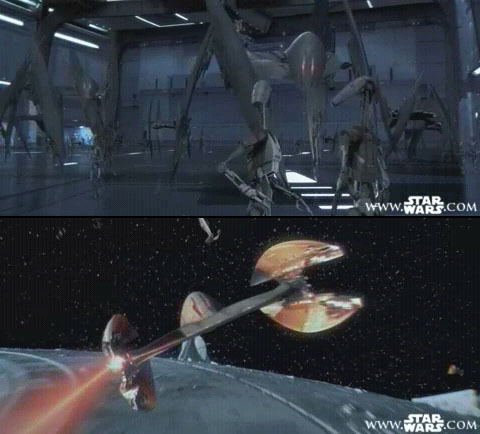 In the latter image, the AT-PT in upright mode is taller than 0.57 times the wingspan of the foreground X-wing, and quite probably greater than 0.64 times the wingspan. 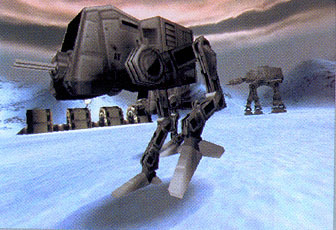 An AT-PT walker in action, from the Rogue Squadron computer game, according to STAR WARS Insider . The CAP-2 light single man Imperial walker built with four limbs, seen in use by Lord Vader's forces around the time of the Battle of Hoth. The hull is built in two sections, front and back. The front part consists of a vertical cylindrical cockpit surrounding the pilot, who is seated upright in an almost standing position. The cockpit canopy is a transparent bubble giving the pilot excellent visibility in many directions. The tail section must contain the vital power and drive systems. The aft end of the vehicle terminates in a large cargo claw that is sometimes seen to hold an immobilised or incapacitated prisoner collected from a battlefield. The weaponry of the CAP-2 is minimal in vehicle terms, but still quite impressive on the scale of footsoldiers. The single blaster cannon is mounted on the forward face of the pilot module, just below the brim of the cockpit canopy. 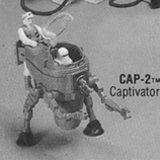 The vehicle's designation "CAP-2" has not yet been interpreted officially, but considering this walker's advantages, its acronym might mean something like "compact assault platform." The vehicle's nickname "captivator" suggests that it may be intended to wade through the lines of enemy footsoldiers to capture vital assets or even to abduct important officers from the field. The articulation of the walker's forelimbs makes the seizure and manipulation of objects and persons feasible for the CAP-2 in a way that is not possible on most other walkers. As well as being nimble and multiply jointed, each arm ends in a grasping claw or hook. Combined with the dexterity of the legs, the grasping ability of the CAP-2 probably allows it to move across terrain at least as difficult as that tackled by the MT-AT. CAP-2, as represented by the classic Kenner scaled replica. 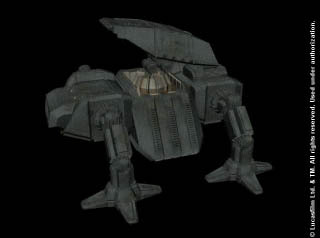 The SecuriTech Espo Walker 101 is one of few observed combat walkers known to be manufactured by a company other than the Kuat Drive Yards corporation. It is an urban, riot control vehicle used by the police and security forces of the Corporate Sector Authority. Not a true war machine, the walker is only partly armoured and there is a broad cockpit canopy to give the crewman good visibility. Espo walker as drawn in Han Solo and the Corporate Sector Sourcebook . 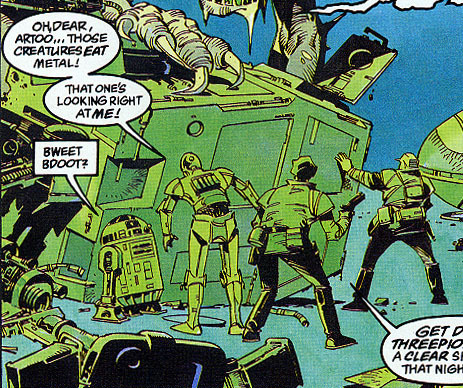 Partial wreckage of several other walker models has been seen strewn across battlefields in several STAR WARS comics. The fragments documented below are complete enough to show that they once belonged to walkers, and that these designs are distinct from those described above. However the incompleteness of the hulls makes it impossible to detail all the features with complete certainty. The TIE Crawler lying just behind the walker wreckage provides an excellent yardstick. The TIE cockpit diameter is about 2.04m, implying that: the circular mount of the portside gun is 1.08m in diameter; the side gun barrel is over 1.30m long; the chin gun is over 1.92m long. The first visible leg segment is at least 3.47m from joint to joint, and the whole visible section is more than 5.20m long. The estimates on the head's upper surface dimensions are 1.63m long and 1.29m wide, but the true values are close to these limits because the viewing angle is modestly direct. A complete walker probably stands about seven metres tall or slightly less. 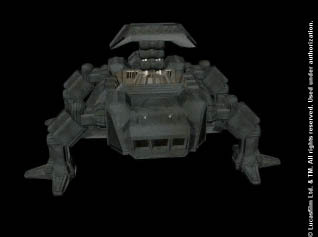 The cockpit size suggests that it is a one-man walker. The pilot's hatch is obscure. It isn't the kind of rounded lid seen on an AT-ST. The best possibility for the hatch is a regular-edged depression in the front-right corner of the top of the head. If there is a substantial body behind the head section then the pilot may actually enter through a hatch on the body, then climbing through a neck passage to reach his cabin. Small-cockpit walker wreckage seen on Coruscant. The leg to lying on the ground to the left is detached; it is definitely from a walker, but it's not absolutely certain to belong to the nearby head. This machine has a boxy hull that is taller than it is wide, and longer than it is tall. By comparison with background AT-AT walkers, the vertical span of the head is less than 7.6m. The body may actually be longer than the visible remains, because the back edges show torn metal. The crew hatch is rectangular and mounted on the upper surface; and there is a armoured window shutter on the port side. A pair of legs is attached to the forward end of the body and they are jointed backwards like the limbs of an AT-ST or the forelegs of a quadrupedal animal. The foot appears hemispherical, and there is at least one squarish toe. Whether there is a pair of hind legs is not yet known. One of the most distinctive characteristics of this walker is the abundance of medium and heavy guns. They are conspicuously asymmetric: about half of the port side of the hull is indented and dedicated to a huge double cannon on a vertical turret; the lower portside of the front face is dominated by a cannon resembling one of the main laser cannons of an AT-AT; and a lighter gun sprouts from the starboard edge of the forward face. There is a rectangular crew hatch on the top of the hull beside the portside gun. 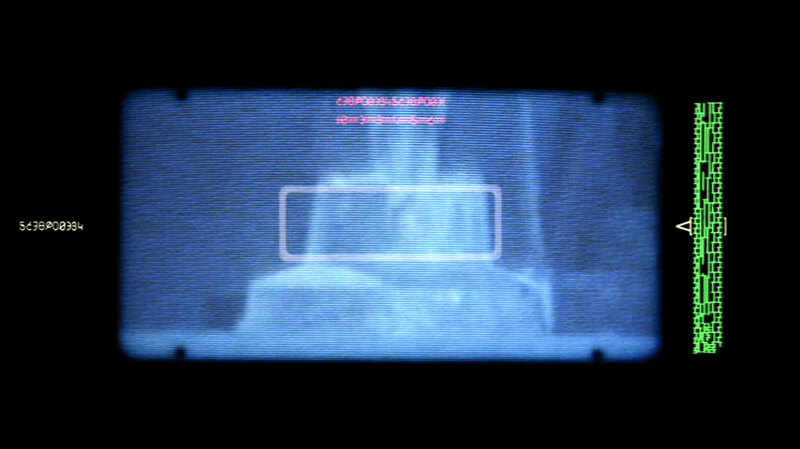 There is a viewport hatch just above the forward laser cannon, which suggests that at least one crewman is seated immediately behind that weapon. 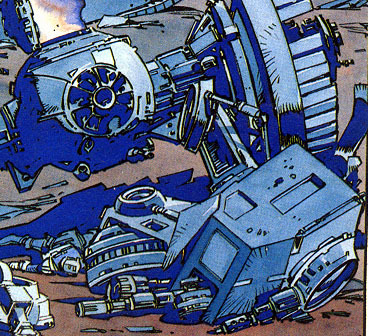 This medium-sized walker was destroyed and lay in the Imperial Palace district on Coruscant during the battles following the Thrawn campaign, [in Dark Empire ]. The surface features of the body are difficult to interpret because this machine is so thoroughly wrecked, but there is at least one pair of legs attaching to the sides of the hull. The legs have a rectangular cross-section unlike those of [medium biped #2]. There may be a small head cabin skewed off to one side of the rest of the wreck, but this is not really clear. The hull of this machine is at least 1.9m in the vertical direction, judging by Luke Skywalker standing nearby. The diameter of the shoulder joint is at least 0.5m, and the leg seems to be at least 0.4m thick. Badly collapsed boxy walker wreck on Coruscant. 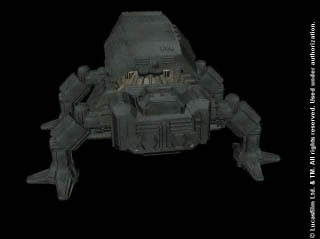 This walker is bipedal and its two legs are attached near the back of the underside of the hull. Each foot has three large claws: one at the back and two at the front. Viewed from above, the hull is boxy and slightly hexagonal. 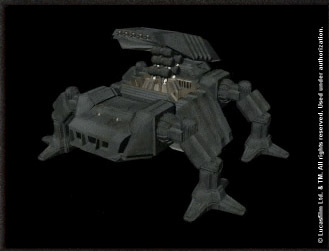 The chin underhang forward of the legs tapers upwards towards the front of the vehicle, where there is a laser cannon in a vertical slot. There is at least one lighter double blaster on a starboard side mount near the chin gun. The viewports are few and unobvious; the only one visible in present images is a hatch above the chin cannon's slot. The rectangular crew ingress/egress hatch is on the rear edge of the starboard side of the hull. The hull is approximately two metres wide, four metres long and two metres deep. The leg fragments suggest a height of about ten metres. Walker wreck far back in the wake of the early New Republic advance on Byss. 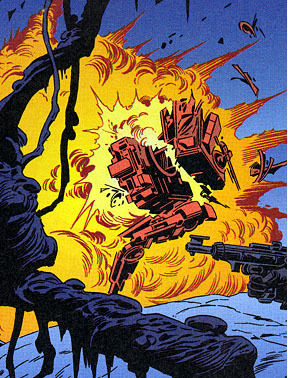 Many walker pieces were seen as Luke Skywalker was sucked up by the Emperor Clone's force storm. One has a boxy hull, a single remaining rounded leg and a distinctive three-toed circular foot. This is reminiscent of [medium biped #2]. They may be the same or similar models. Boxy three-toed hulk is in the top-left corner of this frame. This dexterous bipedal walker from the STAR WARS Galaxy II card series may be an embellished representation, but it seems structurally distinct. [A toy concept from Kenner that was to have been produced in 1986. It evidently was rejected by Lucasfilm. Refer to documentation at this page within this excellent feature at The STAR WARS Collectors' Archive , by G. Lopez.] 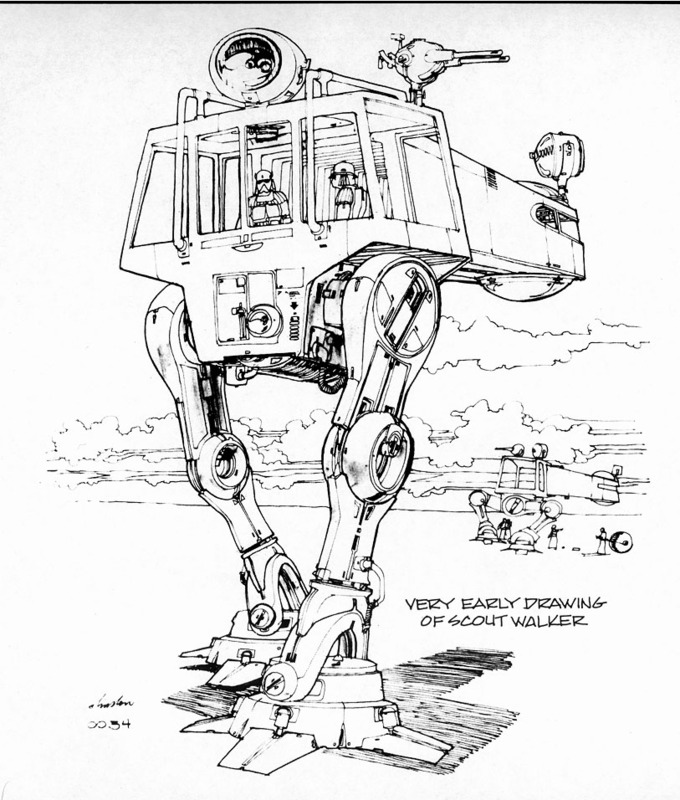 This walker would have had the head, legs and chassis of an AT-AT, but the main body trooper area is replaced by a rear-facing heavy artillary piece. repulsorcraft A vehicle that supports itself through the use of artificial antigravity to push against the planetary surface and ambient gravity field. walker a surface vehicle that moves by successively lifting and placing articulated legs and feet on the ground. Frank Bonura for reporting on the telescoping articulation of the AT-AT foot and leg. 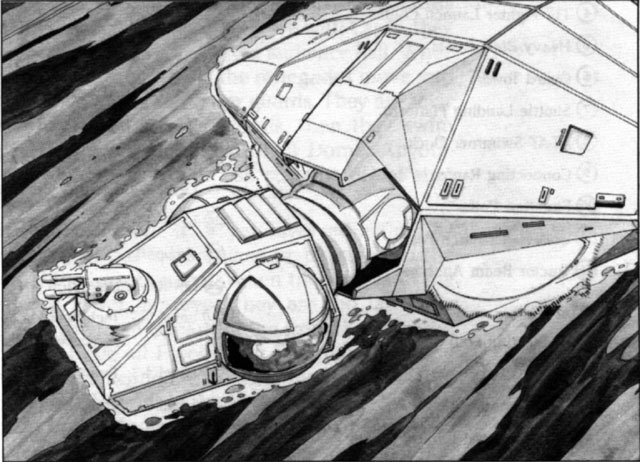 Robert Brown for the Magic of Myth storyboard scan; for the imagery of the AT-AT foot's telescoping action; for AT-AA and AT-AT barge screenshots and discussion; and general discussion. Kevin Dole for suggestions regarding stormtrooper/army distinctions and walker crew uniforms; for alternative interpretations of the role of the AT-AT, attempting to rationalise the low complement of merely 40 troops. 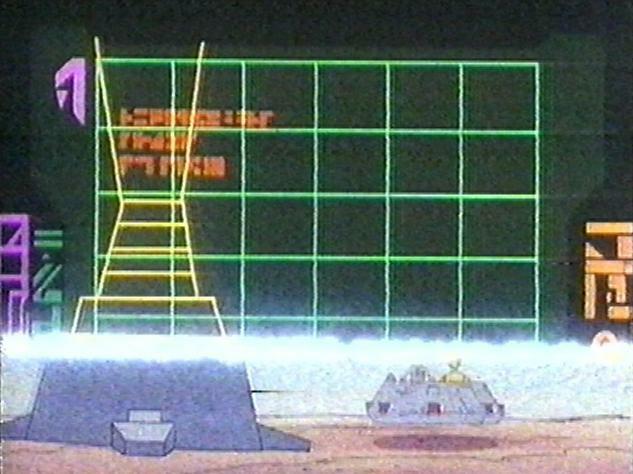 Albert Forge for pointing out the special cahracteristics of the AT-AT blasts against the rebel power generator on Hoth. Matthew Flegal for the roleplaying reference excluding stormtroopers from non-infantry roles; for the link to G.Lopez's documentation of the AT-IC. 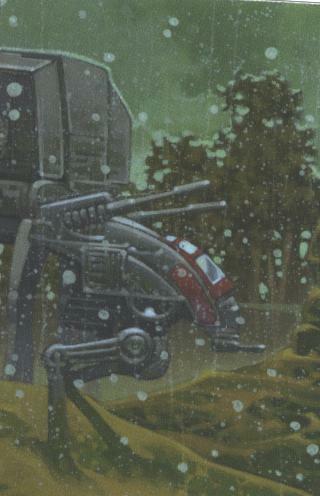 Omer Greenbom for observing that the red window effect on an AT-AT might be a blast reflection. Martyn Griffiths suggested measuring the speed of the AT-ATs on Hoth. Michael Allen Horne for prompting discussion about the differences in walker crew uniforms. Espen Joergensen for scans of the carrier AT-TE; for the discovery and scans of medium biped #3. Daniel Krouse for AT-XT comic images and information. Chris Maier for drawing attention to the walkers in X-Wing Rogue Squadron ; for AT-PT screenshots; and for compiling an extensive list of other walker classes. James McFadden for pointing out the AT-AT Swimmer, via the SWFA web site. Leonid Panfil for the AT-AV reference. David West Reynolds for discussion of the meaning of the distinctions in walker crew uniforms. K?vin Schaefer for AT-XT computer game images, weaponry and other information. Lar Vang for suggesting a connection between the AT-STs and stormtrooper effectiveness on Endor. Michael Wong for general discussion. Brian Young for suggesting measurement of a lower limit on the size of the Hoth power generator; for suggesting articulation/balance as an advantage of walkers over single-piece vehicles like repulsorcraft. The Art of STAR WARS: Episode III Revenge of the Sith , Jonathan Rinzler, Del Rey, 2005. The Art of STAR WARS: Episode V The Empire Strikes Back , Del Rey. The Art of STAR WARS: Episode VI Return of the Jedi , Del Rey. The Art of STAR WARS Galaxy Volume Two , Topps. Attack of the Clones: Incredible Cross Sections , Curtis Saxton et al., DK Publishing, 2002. Battle for the Golden Sun , Douglas Kaufman, West End Games. Classic STAR WARS #1 , Archie Goodwin & Al Williamson, Dark Horse Comics. 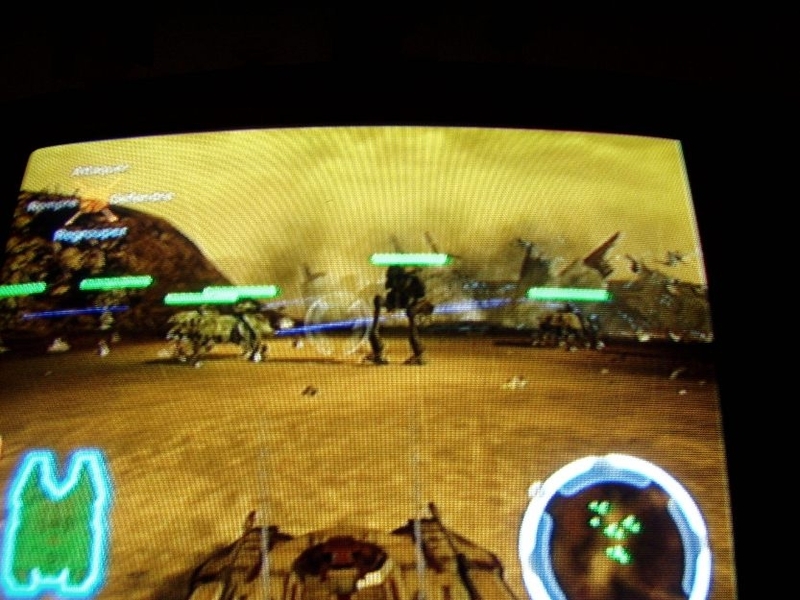 Clone Wars [computer game], LucasArts. 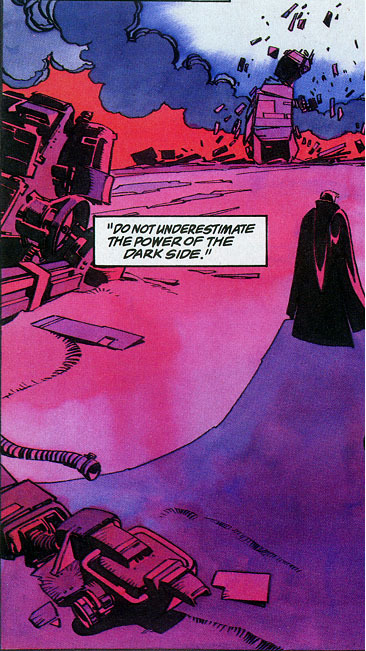 Dark Empire II , Tom Veitch & Cam Kennedy, Dark Horse Comics. Dark Force Rising , Timothy Zahn, Bantam Books. Dark Force Rising Sourcebook , Bill Slavicsek, West End Games. Empire #16–18 , Dark Horse Comics, 2004. Essential Guide to Vehicles & Vessels , Bill Smith, Del Rey. Han Solo and the Corporate Sector Sourcebook , Michael Allen Horne, West End Games. Inside the Worlds of Star Wars: Trilogy , James Luceno et al., DK Publishing, 2004. The Rebel Alliance Sourcebook , West End Games. 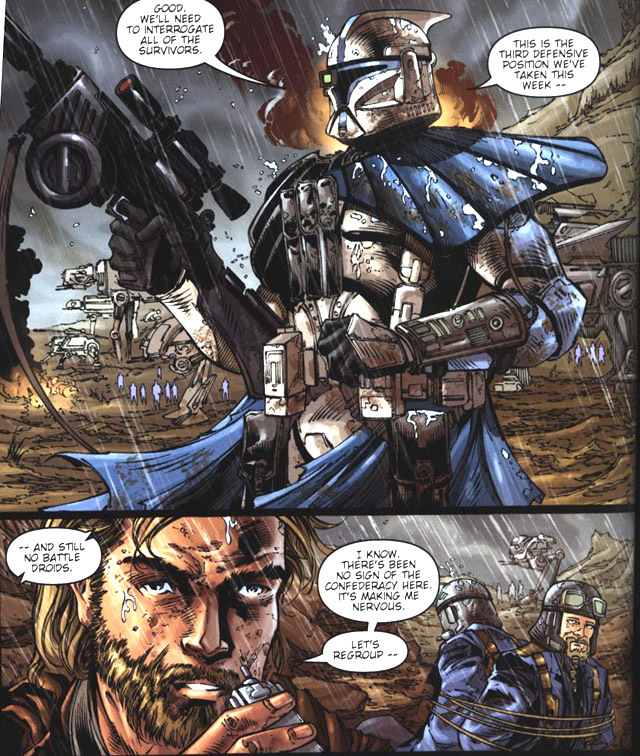 Republic #55 – 58, The Battle of Jabiim , Haden Blackman et al., Dark Horse Comics, 2003. The Jedi Academy Sourcebook , ,West End Games. Rules of Engagement: Rebel Spec Forces , West End Games. STAR WARS III: Revenge of the Sith , comic adaptation, Dark Horse Comics, 2005. STAR WARS V: The Empire Strikes Back , George Lucas et.al., Lucasfilm Ltd, 1997. STAR WARS V: The Empire Strikes Back , Donald F. Glut, Del Rey, 1980. STAR WARS VI: Return of the Jedi , George Lucas et.al., Lucasfilm Ltd, 1997. STAR WARS: The Essential Guide to Vehicles and Vessels , Bill Smith, Del Rey. STAR WARS Galaxy , card series 1, Topps. STAR WARS Incredible Cross Sections , David West Reynolds et al., DK Publishing, 1997. STAR WARS Technical Journal Volume 2: The Imperial Forces , Shane Johnson, Starlog Communications International. STAR WARS The Visual Dictionary , David West Reynolds, DK Publishing. X-Wing Rogue Squadron: The Rebel Opposition , Dark Horse Comics. X-Wing Rogue Squadron: Mandatory Retirement , Michael A. Stackpole et al, Dark Horse Comics. Dictionary of Geology, The Penguin , D.G.A. Whitten with J.R.V. Brooks, Penguin. Original content is © copyright Dr Curtis Saxton 1999–2005. Online since 15 March 1999. Last updated 25 September 2005.